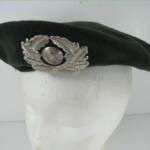 USMC Garrison Cap: With EGA screwback insignia.. Good condition. ID'd to "Green". . Dates from the 2000's. 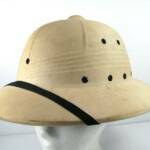 Pith or Sun Helmet: Time period unknown. This one has no contract stamping in it. 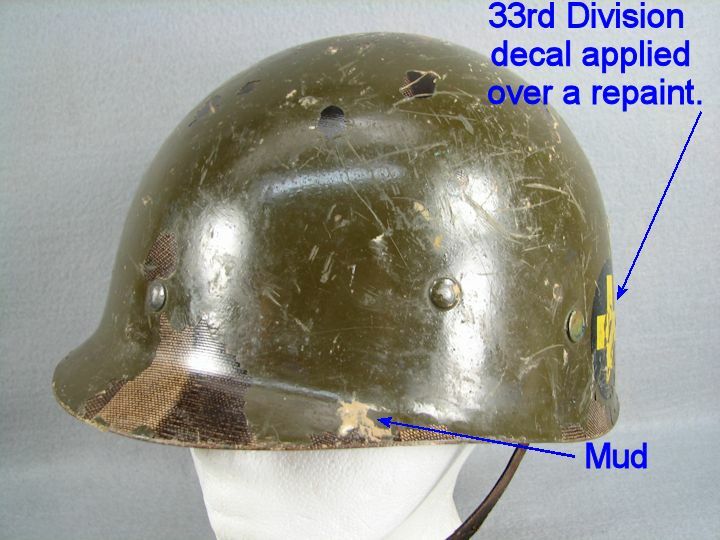 Some differences I see in it compared to my others with the contract stamps are: the metal on the inside is unpainted and in two of the other helmets it is black; the adjustment holes in the headband do not have grommets and on the other helmets they do; the chin strap is black and on the other helmets it is khaki; the chin strap has hooks on the ends where the other helmets have a hole on the ends and the hook is on the helmet; the vent hole grommets are black and spread over on the inside and on two of the other helmets they are khaki color and have no rim on the inside; the green is a darker green. That is about all I can tell. 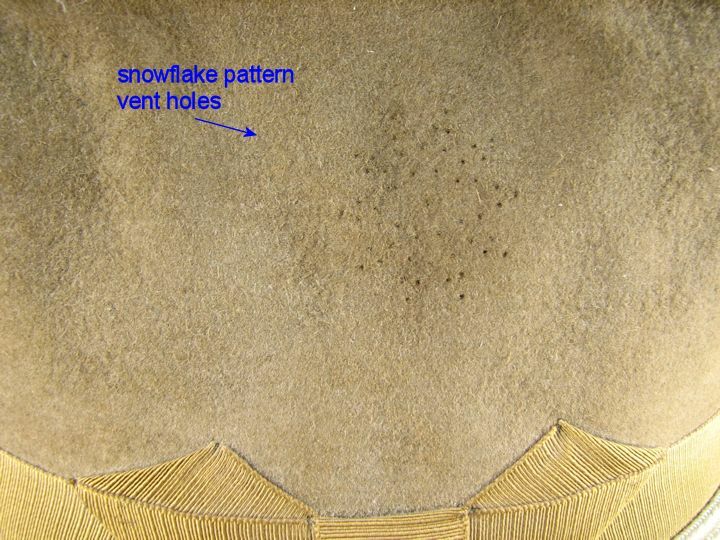 It has a bad stain on the back and has a couple of small breaks on the inside top that are not on the outside. 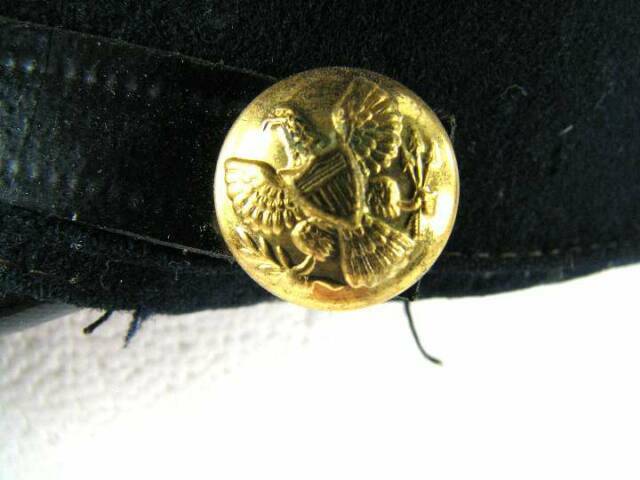 1895 Dress Cap: Indian Wars-Spanish American War uniform cap, model 1895. Lacking top condition but priced right for someone needing a display example. ID'd inside to WCC which may be Western Costume Company. They rented gear to the movie houses and this hat may have seen action in old Western movies. 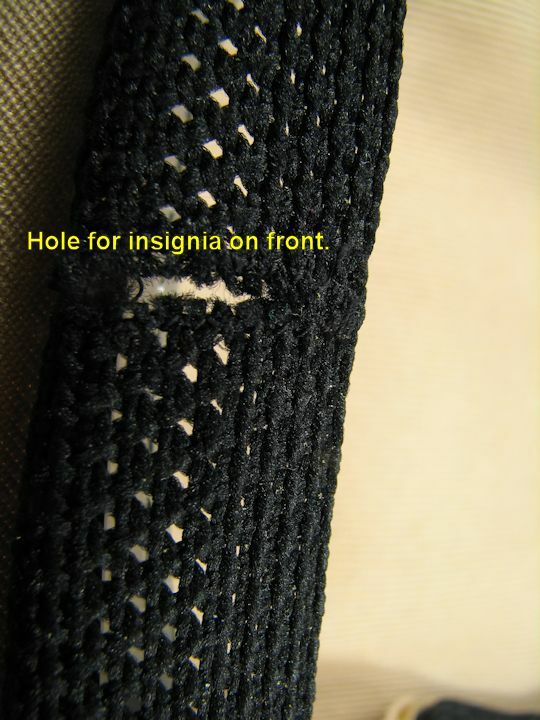 Lining is missing and/or torn; sweat band missing pieces; several moth holes. Please see photos for condition. I bought this from a well known militaria dealer and I am sure I paid more than what I am asking. 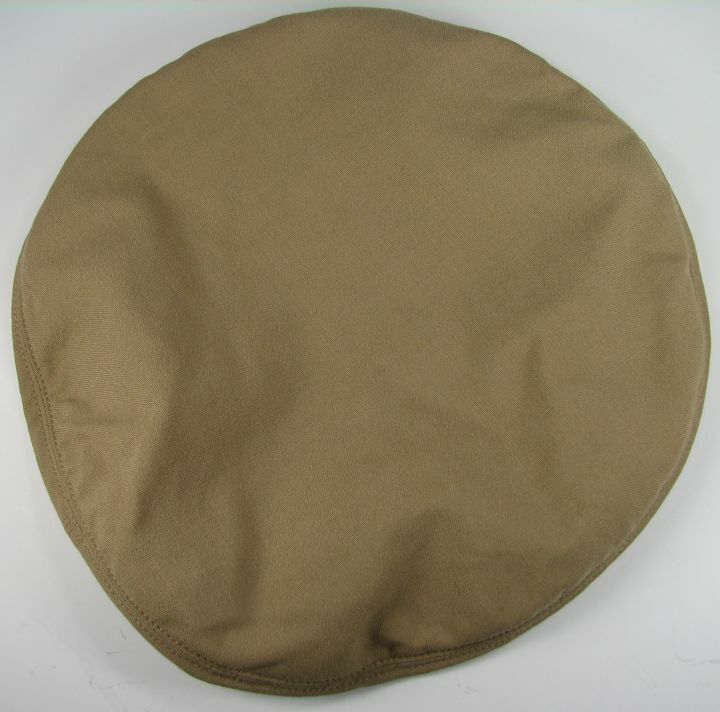 USMC Garrison Cap: The top is sewn closed. It has a metal grommet for the EGA. No contract tag. It is the bottom one shown in the photo. 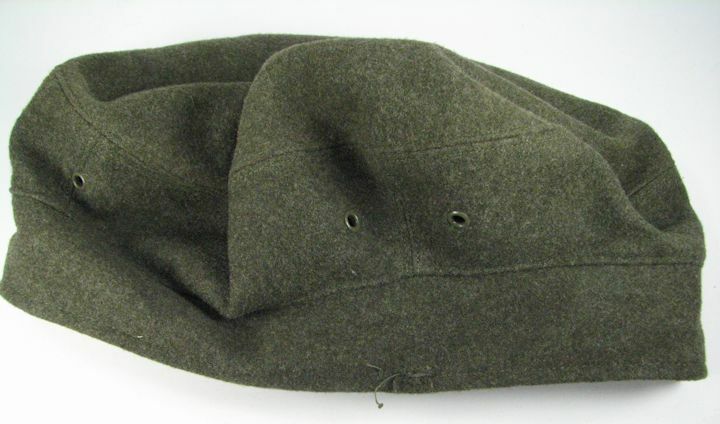 1937 French EM Kepi: I believe this cap is a French Enlisted Man's Kepi adopted in 1937. Pretty decent condition with a PARIS maker label. Several moth holes that to me look repairable by cutting some matching color felt and gluing the plug in the hole; or display as is. 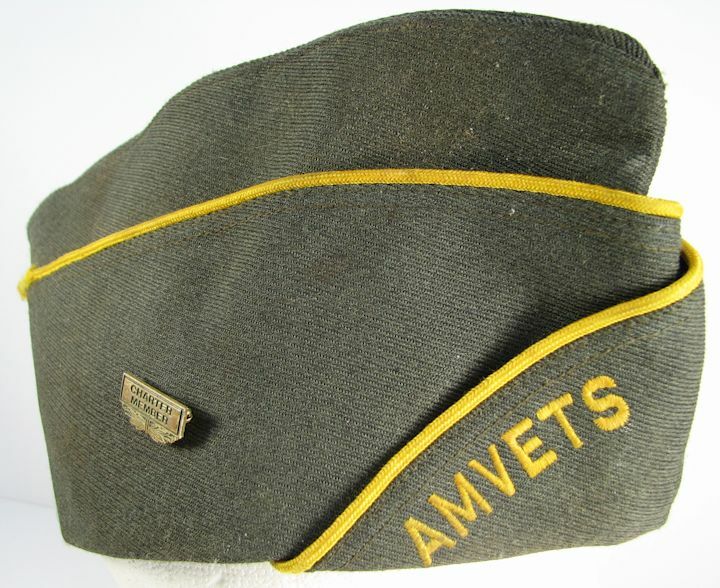 WW2 OVERSEAS CAP, 1942 dated: Full contract tag with 1942 date. Size 7? or Inspector 7? No other indication of size. 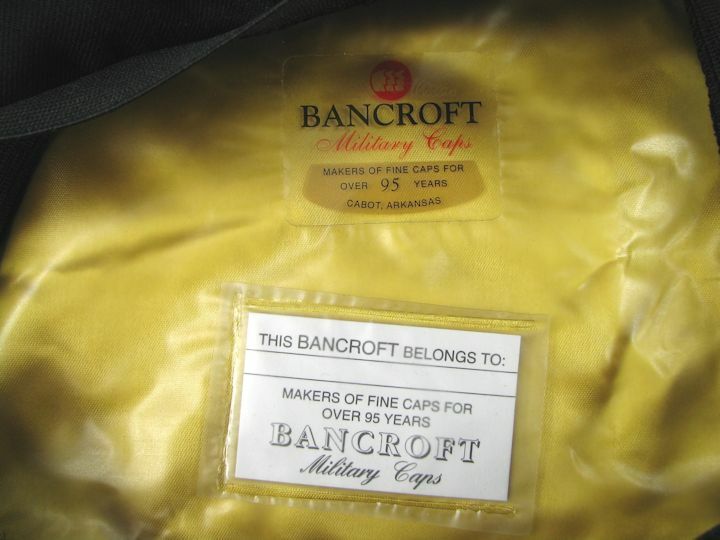 Made by BANCROFT. 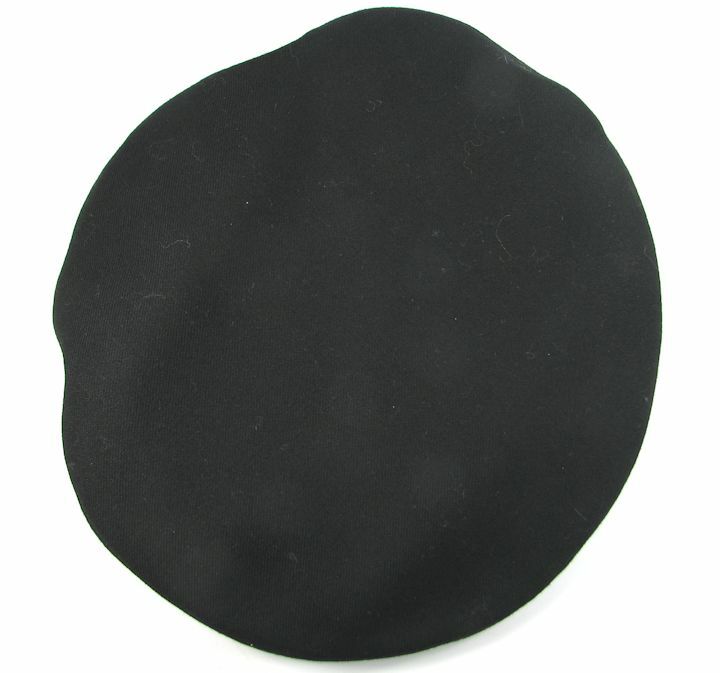 EAST GERMAN WOMEN'S BERET: Looks black to me. Nice badge with double screwback fastners. 1/2" moth track on top, no holes. 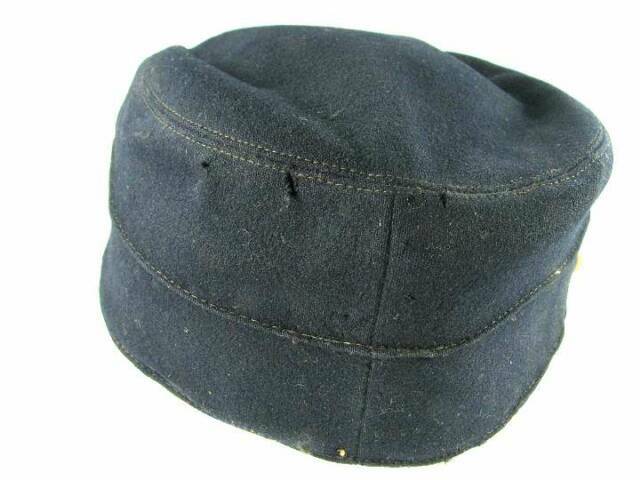 US NAVY DRESS BLUE CAP: This is the Donald Duck type issued dress blue cap. I see no problems with it. Size 6 5/8. Age unknown. USMC COVER: Nice, I see no problems with it. 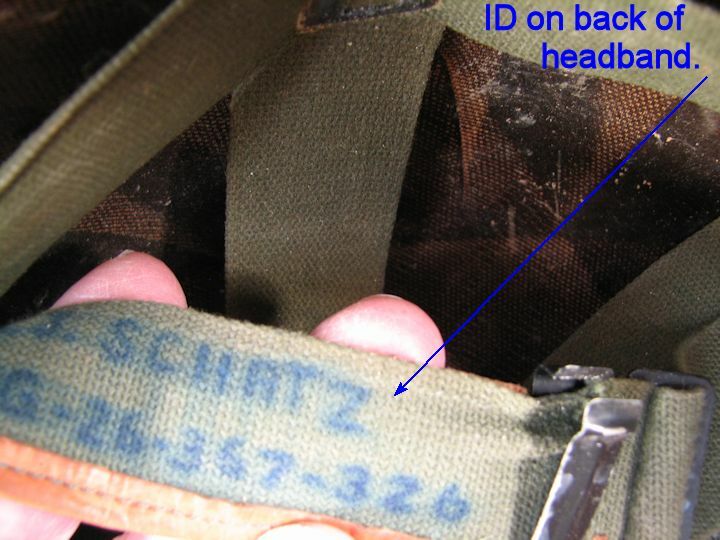 There is an ID but it is unreadable. 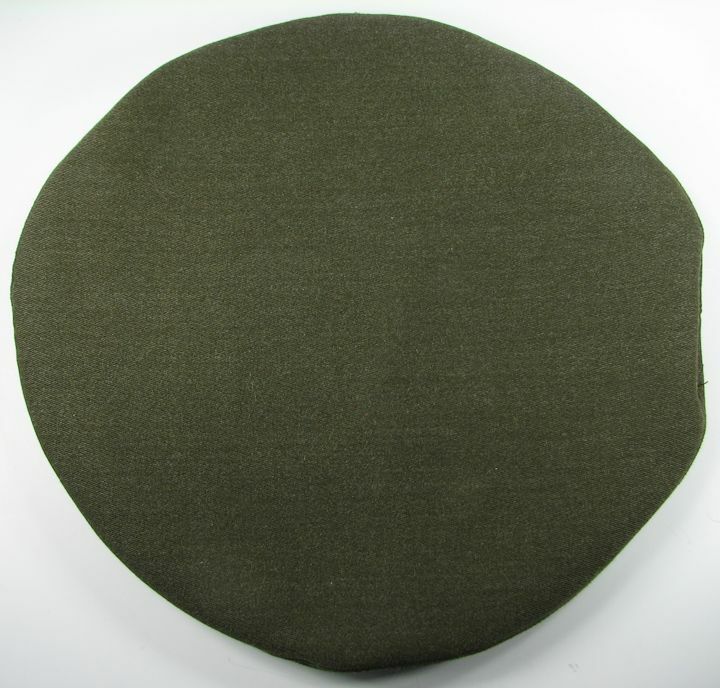 It is the green wool color. U.S. NAVY, Lt. Cmdr. 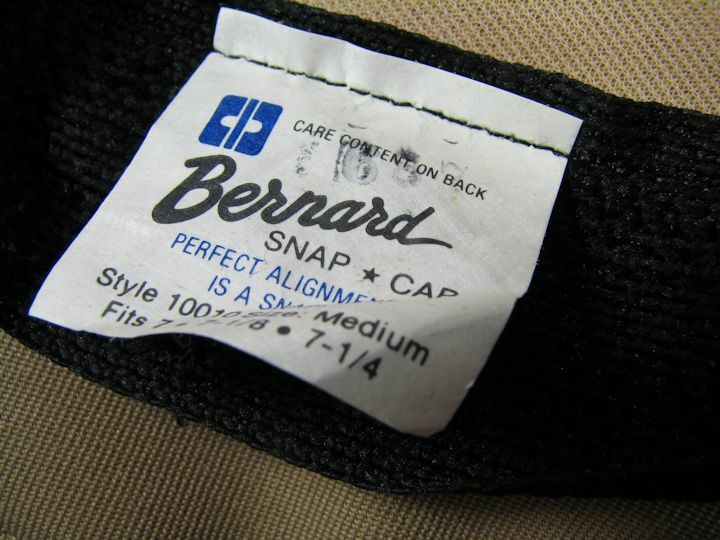 GARRISON CAP by BERNARD: Very nice cap. Has a STERLING and Gold Fill, pinback Navy pin and a Gold Fill Lt. Commander clutchback pin. Both pins are Hallmarked "GEMSCO". 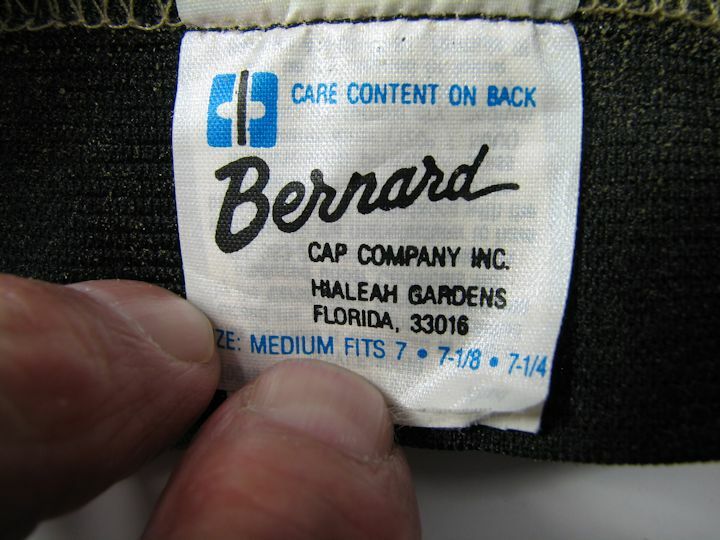 Cap was made by BERNARD and the address has a zipcode so it will date after 1963. This is a nice size 7 cap with nice pins on it; I see no problems with it. 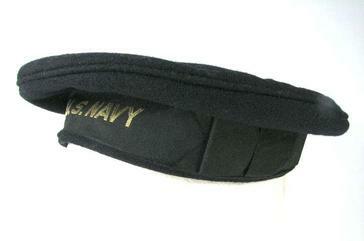 CHIN STRAP FOR U.S. NAVY OFFICER'S BILLED VISOR HAT: Measures 1/2" wide with adjustable length. Complete with USN attaching studs. As new and never used. U.S. AIR FORCE Lt. COL. OFFICER'S HAT: Pretty nice hat. I believe with the silver chin strap this would be a "Dress Mess" hat. The metal crown stiffener has been removed which was a common thing (I have one you can have to go with the hat if you want it). The plastic liner has some wear and soiling. Hat was made by FLIGHT ACE, San Antonio. I see a 1969 date on the label. Hat emblem is N.S. Meyer, Inc., New York with the shield. Size 7. 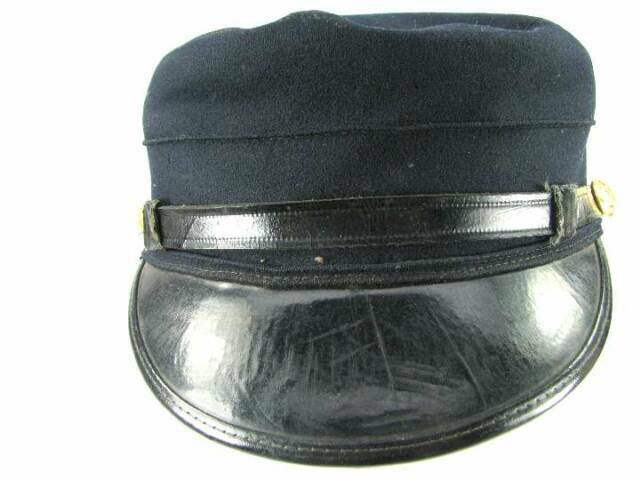 U.S. AIR FORCE OFFICER'S GARRISON CAP: Looks in pretty good condition with leather sweatband and royal purple lining. No tag left in it to indicate size.. 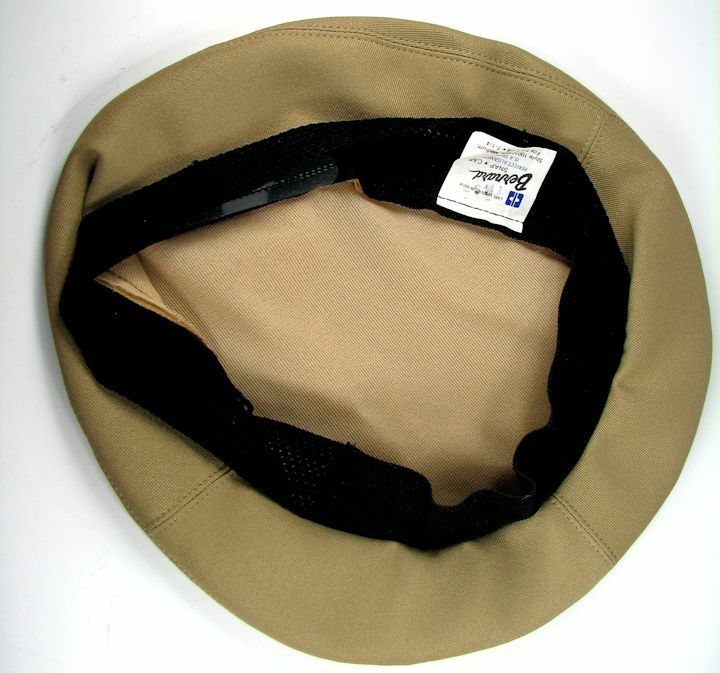 BILLED VISOR COVER: I believe this is U.S. Navy, but am not sure. It has a size tag of 6 3/4 and no other tags. 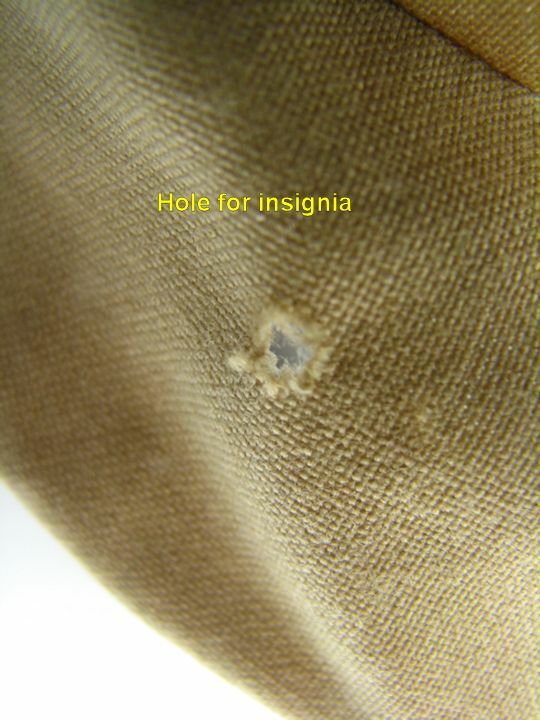 The lining is gray, there is a hole from using an insignia with it so I think this has been on a frame. However, it is bright and clean with no problems. BILLED VISOR COVER by BERNARD: I believe this is U.S. Navy, but am not sure. It has a tag from BERNARD which has a zipcode on it so it is after 1963. It has the black elastic ribbon around around it. 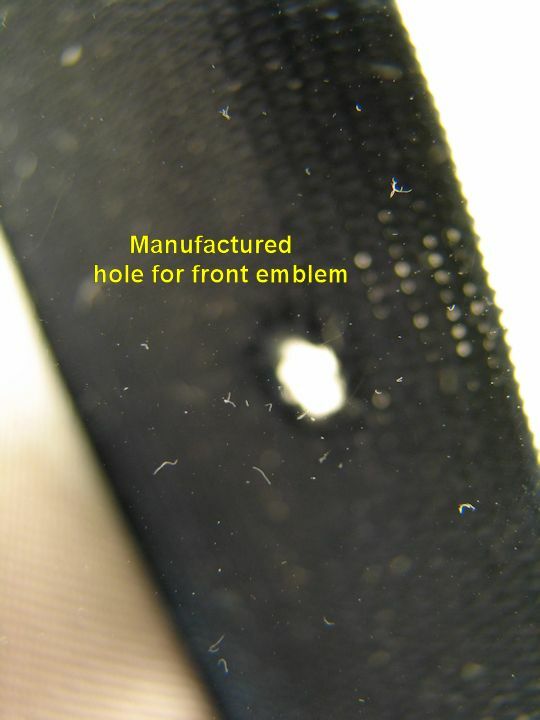 A manufactured hole for front insignia. Khaki colored lining. Bright and clean with no noted problems. Size 7 to 7-1/4. BILLED VISOR COVER by BERNARD: I believe this is U.S. Navy, but am not sure. It has a tag from BERNARD which has a zipcode on it so it is after 1963. 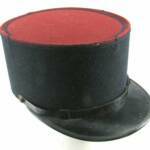 It has the black ribbon around it which half is woven and the other half is elastic. It has a manufactured slot in the front for insignia. Khaki colored lining. Bright and clean with no noted problems. Size 7 to 7-1.4. 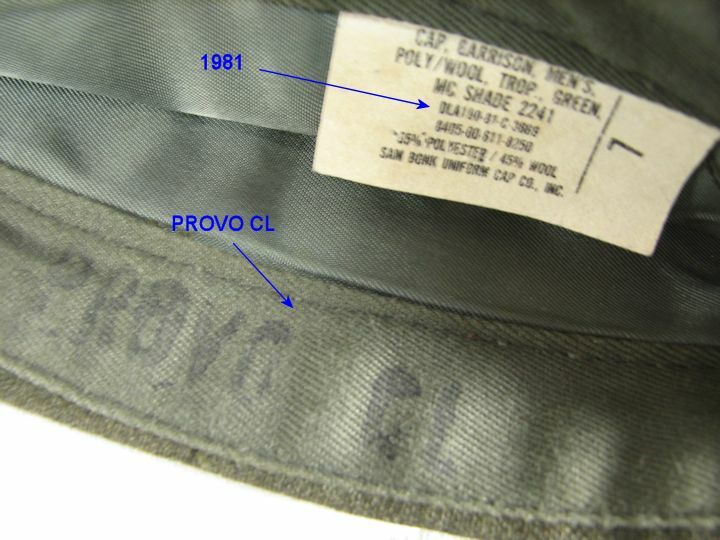 BILLED VISOR COVER: I believe this is U.S. Navy, but am not sure. 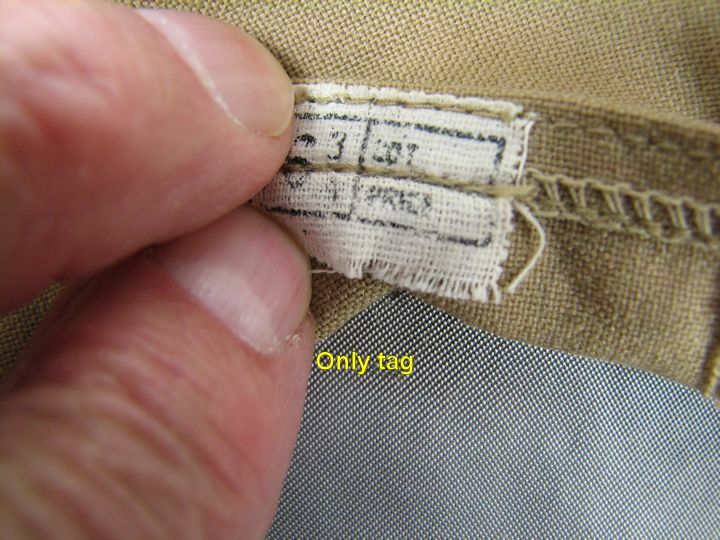 Only tag in it is the size tag; 6-3/4. Not an elastic band, same material as the rest of the cover. It has a black satin-like lining. Only holes are the two manufactured for the side button/ studs. Clean. 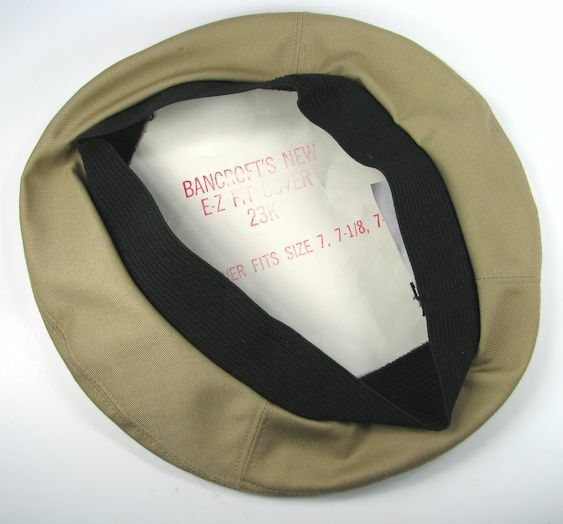 BILLED VISOR COVER by BANCROFT: I believe this is U.S. Navy, but am not sure. It has a Bancroft label and a Bancroft cardboard insert. 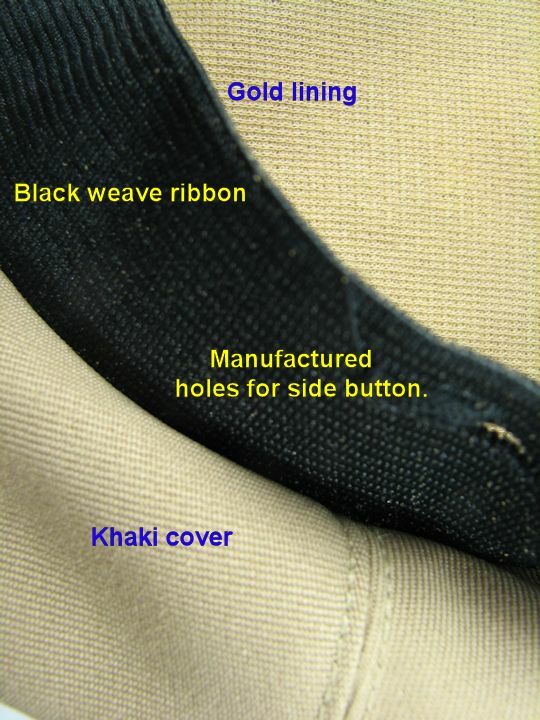 Lining is khaki colored. 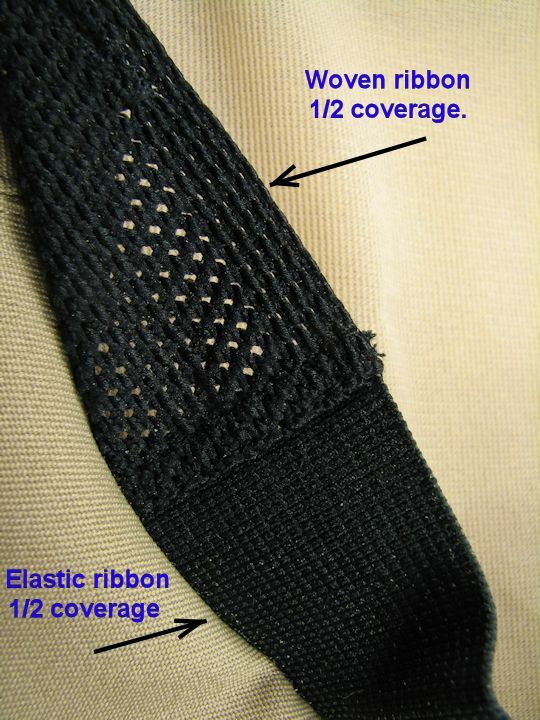 Black band ribbon is all elastic. Manufactured side holes for the button/studs. Bright and clean and most likely never used. 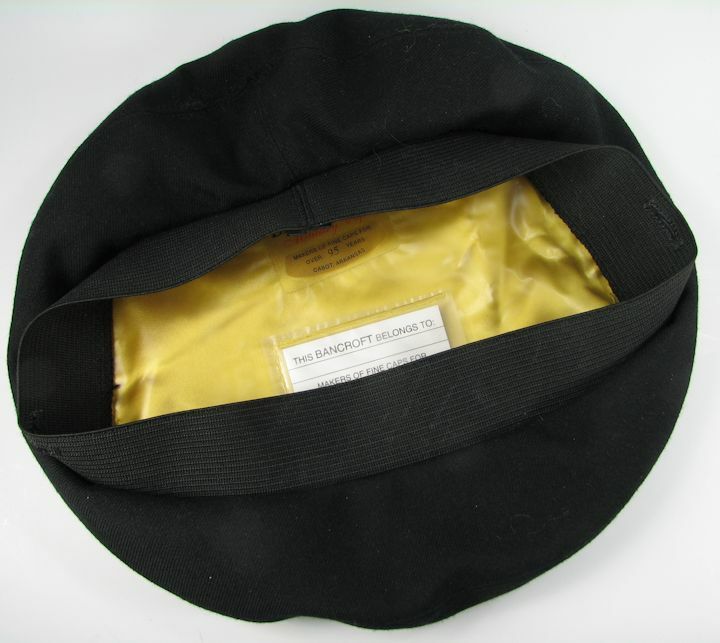 BILLED VISOR COVER by BANCROFT: I believe this is U.S. Navy, but am not certain. 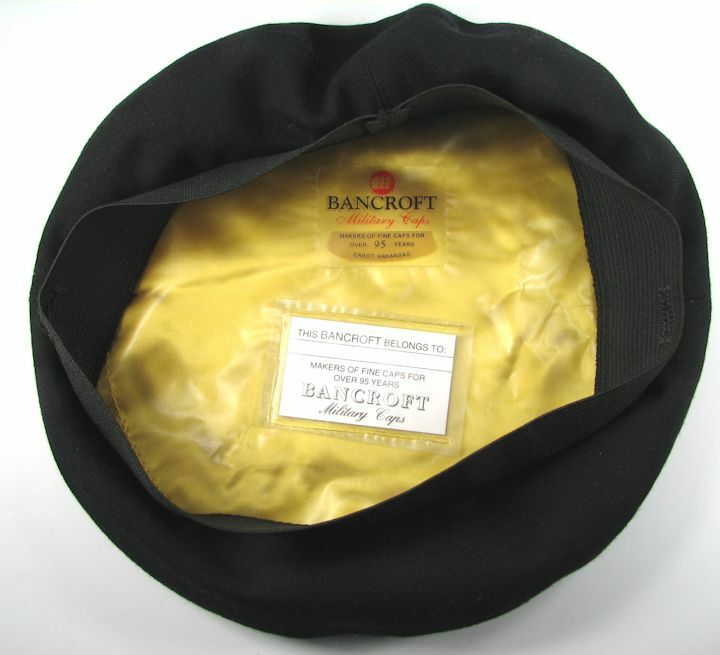 It was made by BANCROFT and it has a plastic lining on which the labels are fixed over the gold lining. It is black and has a full elastic band. Appears to not have been used and is bright and clean with the exception of lint or fuzz as seen in the photos which will brush off. Manufactured side holes for the buttons/studs. 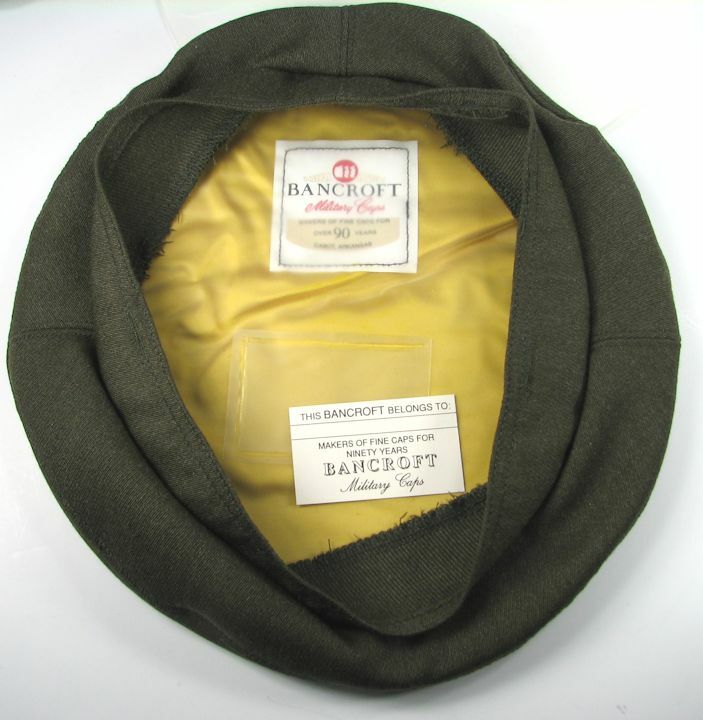 BILLED VISOR COVER by BANCROFT: I believe this is U.S. Navy, with the green color indicating the AVIATION branch. 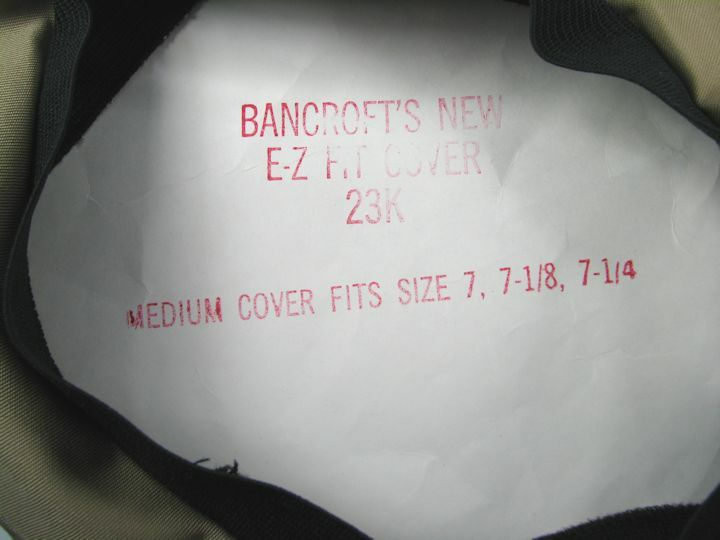 It was made by BANCROFT and has a plastic lining on which the labels are fixed and over that is a cardboard insert. 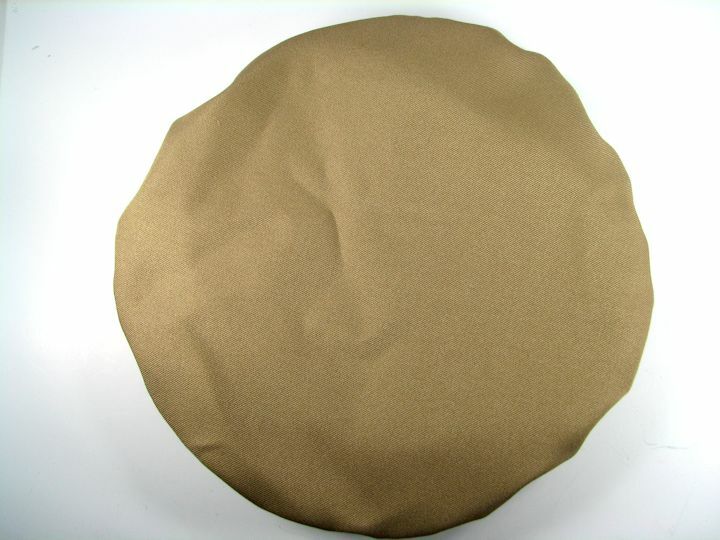 The lining is gold colored satin-like material. On the cardboard insert is the size of 7-1/2. Manufactured side holes for the attaching buttons/studs. I see no problems with it. 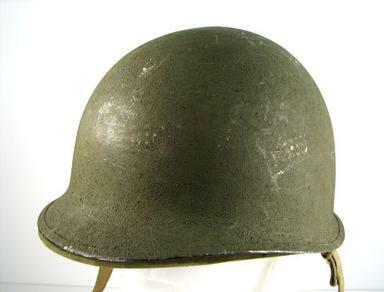 WW2 CLOTH US ARMY AIR FORCE FLIGHT HELMET, AN-H-15: Very nice summer helmet with little use. No problems noted. Nice velvet covered chin strap. Made by Bates Shoe Company, size Medium. CAP, WOMEN MARINES ASSOCIATION: Complete with KREW made, screwback EGA insignia. Lettered MO-1 which I believe is Missouri. Size is Medium. Lining is a black satin like material. No problems with it. 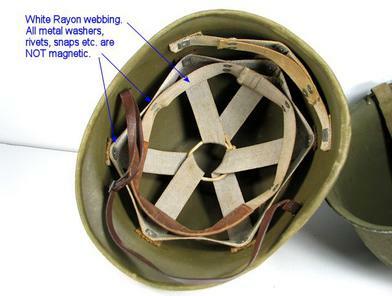 WW2 HELMET, McCORD SHELL, WESTINGHOUSE LINER: See the photos for more info. 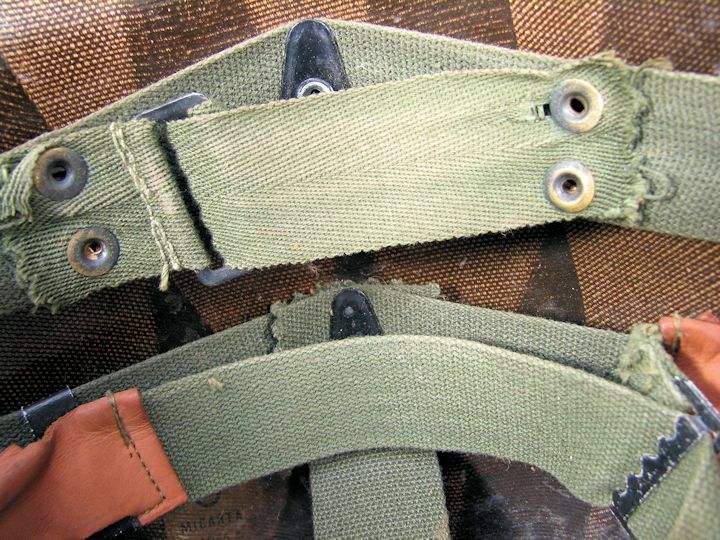 Front seam, heat lot number 586C, swivel bales, sewn on chin straps, blackened and rust steel buckle with a T-1 Quick Release Conversion piece (thanks Lewis and the US Militaria Forum), original cork and paint, no dents. Paint worn off at top back. 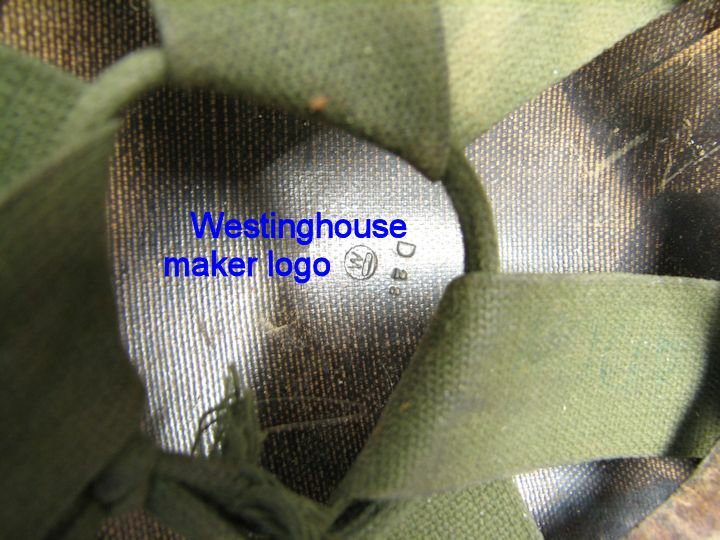 Liner logo is Westinghouse with the leather chin strap and original paint. The sweatband and nape strap may be later replacements. 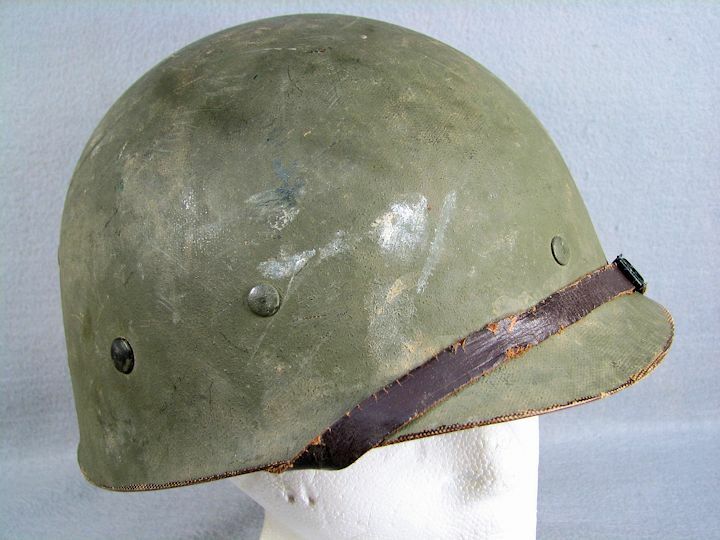 WW2 HELMET, McCORD SHELL, FIRESTONE LINER: See the photos for more info. Front seam, heat lot number 198C or 197 ? Swivel bales, sewn chin straps, blackened steel buckle. A couple small cracks as shown in the photos. Paint has runs, may be a repaint ? Firestone logo on liner with original paint. 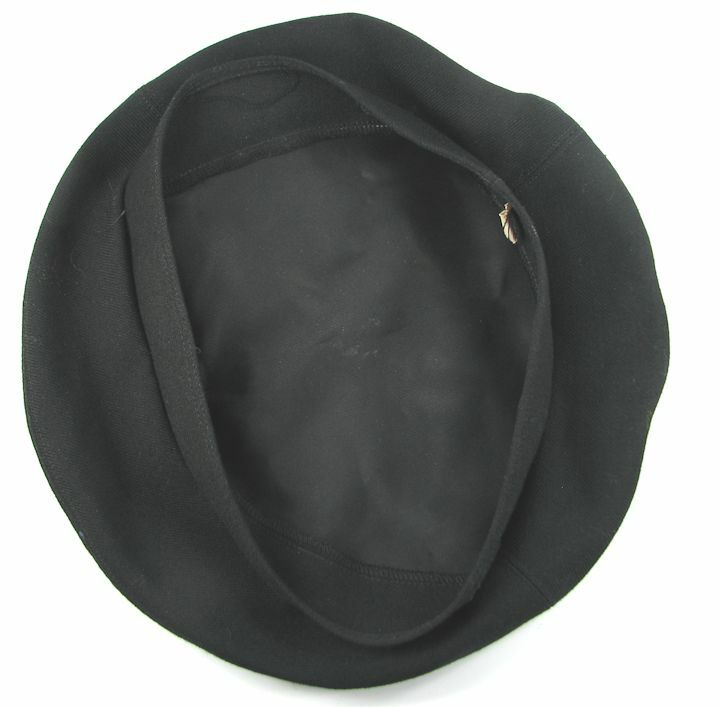 PRE-WW2 & WW2 LAMBSKIN LINED WINTER CAP: This is a winter cap for issue to troops in cold climates. Alaska based and worn in other theaters as evidenced by existing photos of men wearing them. Nice pre-war contract tag on the inside dated May 2, 1941. This one looks good and has minimum wear from usage. 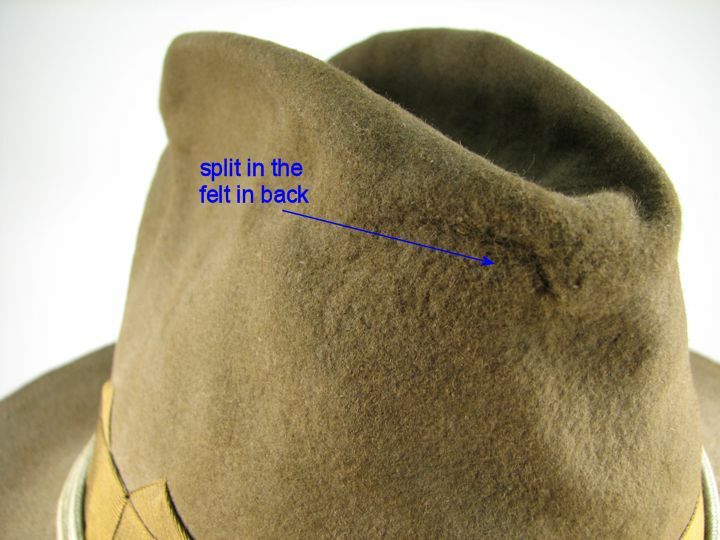 The only "fault" that I can find is a series of cuts around the inside which I presume was done to loosen the fit by the soldier. I see one cut that was deep enough to be seen from the outside and I show this in the photos above. 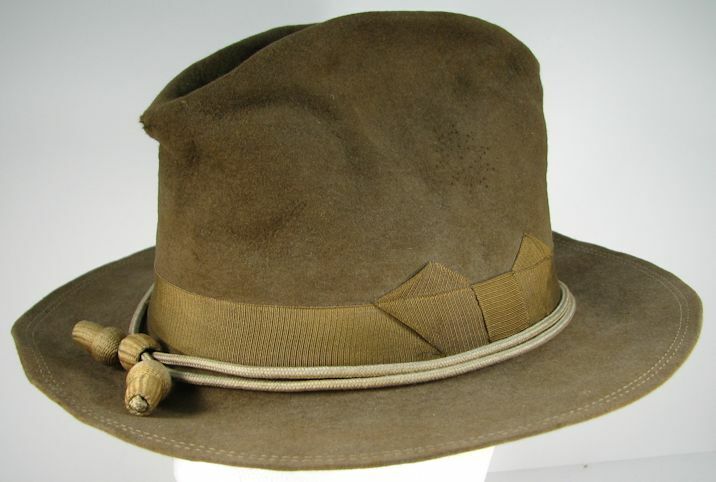 Even with the cut this cap will display nicely and is a good example of a hard to find, early issued, piece of headgear. 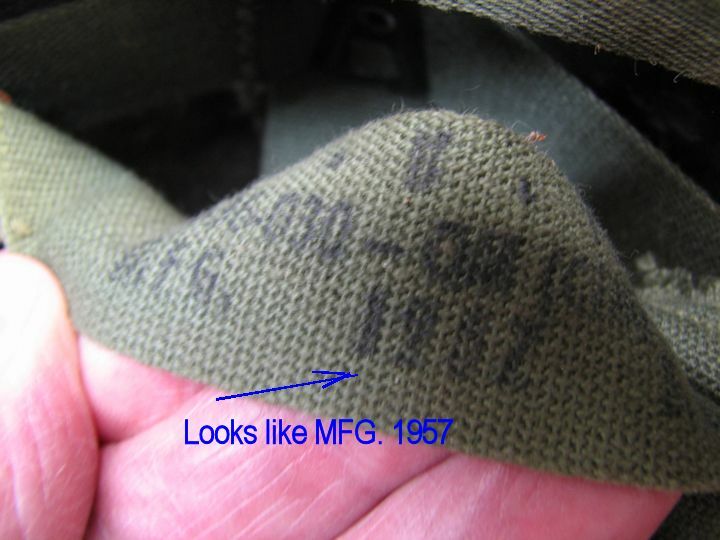 CAP, UTILITY, USMC: Contract date looks to be 1999. It is near new condition with no apparent problems. Size is SMALL, probably around a size 7. Inside is lined. Strong EGA on the front. Five line stitching on the bill. 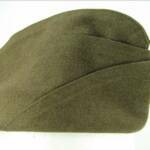 ID'd TO 1st SERGEANT HINTON, US ARMY: CAP, COMBAT, WOODLAND CAMOUFLAGE PATTERN, size 7. Lined and with ear flaps. Contract date of 1983. 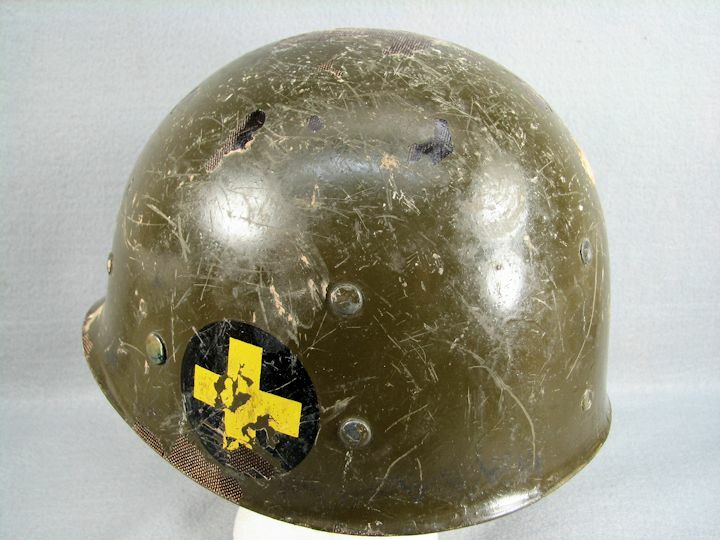 Used condition with First Sergeant pin on the front and HINTON name tape on the back. 7 row stitching on the bill. 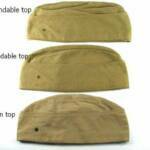 CAP, UTILITY, WOODLAND CAMOUFLAGE PATTERN, TYPE 1, USMC: Size SMALL. 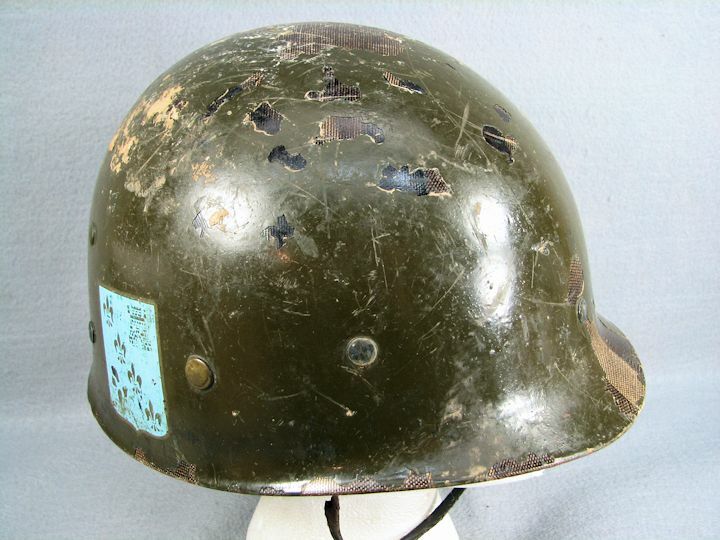 Faded, but visible EGA on the front. 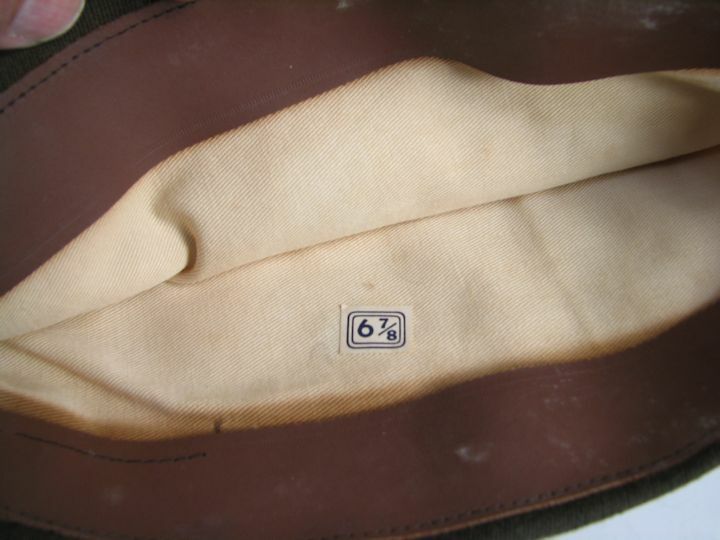 Name of HYDEN written on the inside lining. Contract date looks like 1997. 5 row stitching on the bill. No problems noted, just used. VETERAN'S BALL CAP, GUIDED MISSILE CRUISER 65, USS CHOSIN: One size fits all. Made in the USA. Used and dusty, needs cleaned up. Vet was an original crewmember as denoted by the word "Plankowner" on the back. CG-65. VETERAN'S BALL CAP, NUCLEAR AIRCRAFT CARRIER 68, USS NIMITZ: One size fits all. Made in the USA. Used. CVN-68. MILITARY ORDER PURPLE HEART: Name was changed a couple of years ago to "Military Order OF THE Purple Heart". No problems noted with this grouping. 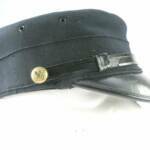 Includes the cap with a metal badge sewn on; two shoulder boards with Great Seal buttons and two patches as shown. Nice. VETERAN'S BALL CAP: "Coast Guard Combat Veteran's Association". One size fits all. Made in the USA. Used. As pictured. 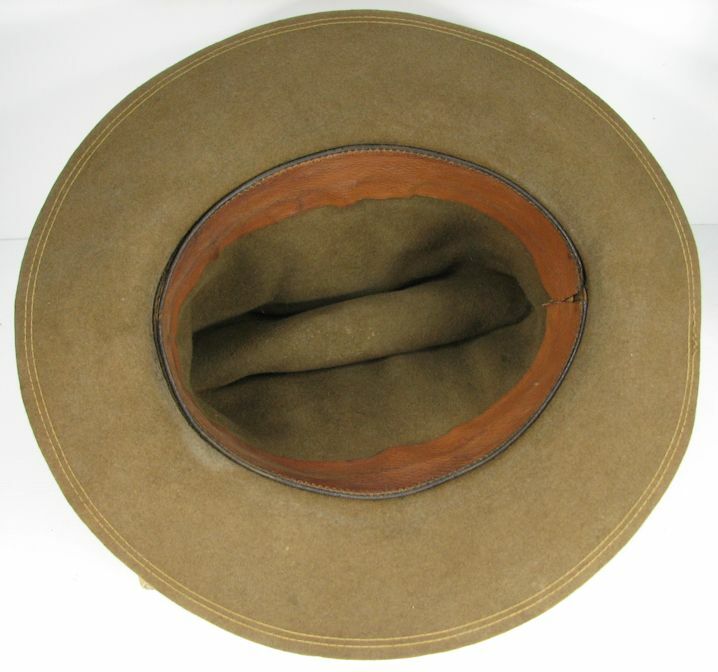 GREENLAND PATROL, WW2, US COAST GUARD: Veteran's Ball Cap. No problems. One size fits all. Made in USA. Used. As pictured. USS MOHAWK CG, WPG-78, VETERAN'S BALL CAP: WW2 Coast Guard Cutter served with the Greenland Patrol, . Had 14 attacks on enemy submarines. Last ship to communicate with IKE on D-Day advising of weather conditions. Used. 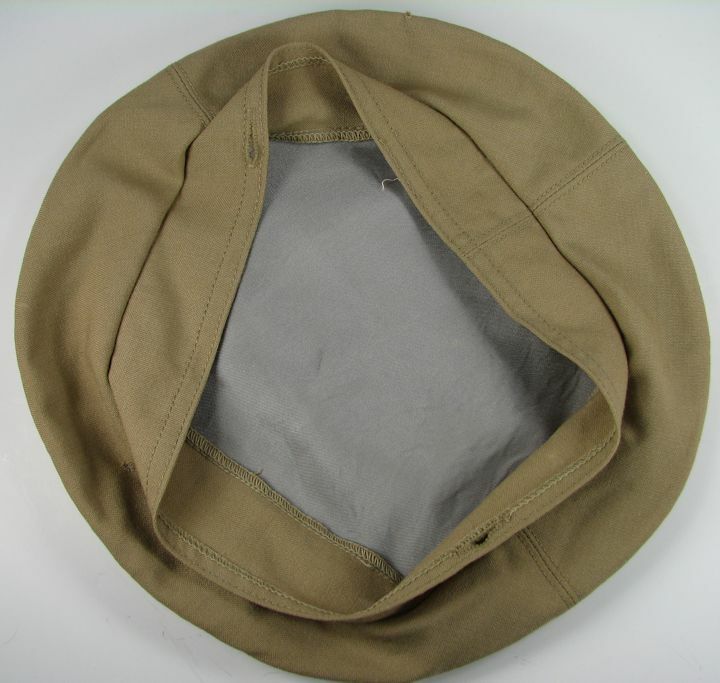 VIETNAM WAR, AIR FORCE UTILITY CAP: Six panel, each vented, baseball style cap worn in the Vietnam era by US Air Force personnel. Originally had ink stamp data but that has worn or washed off. No damage noted. Flexible bill with 9 rows stitching. Hard cap to find. 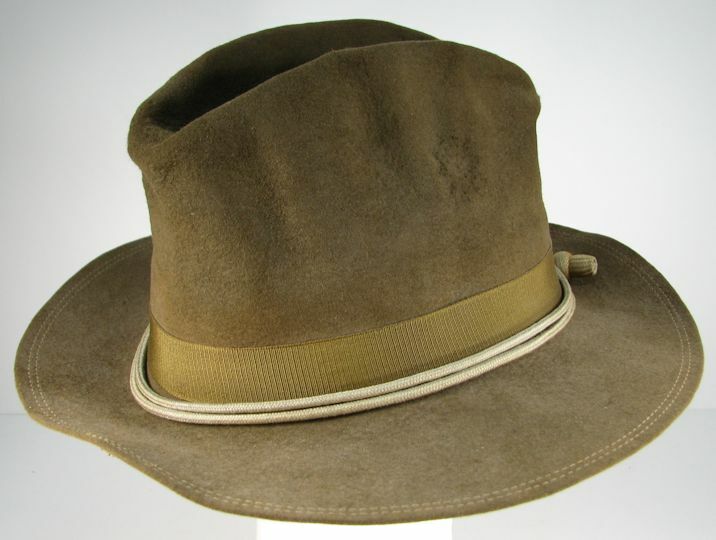 CAP, HERRINGBONE TWILL, O.D.-7, SIZE 7: As new and unwashed. 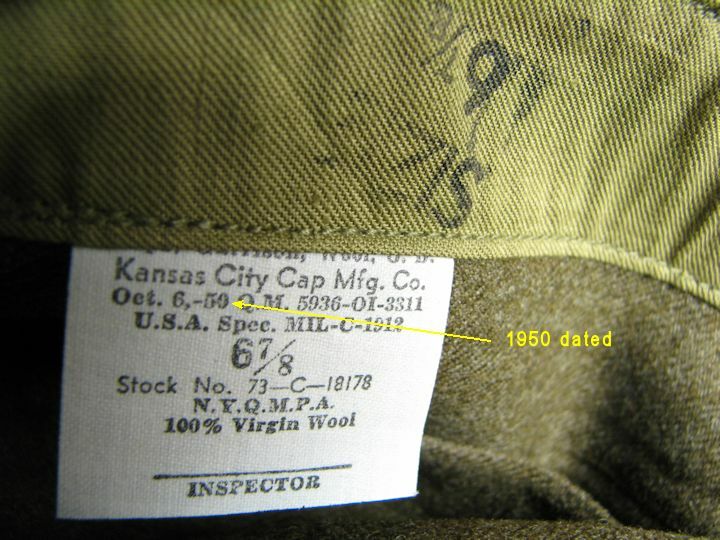 Contract date of August 31, 1945 and a manufacture date of Jan. 20, 1951. 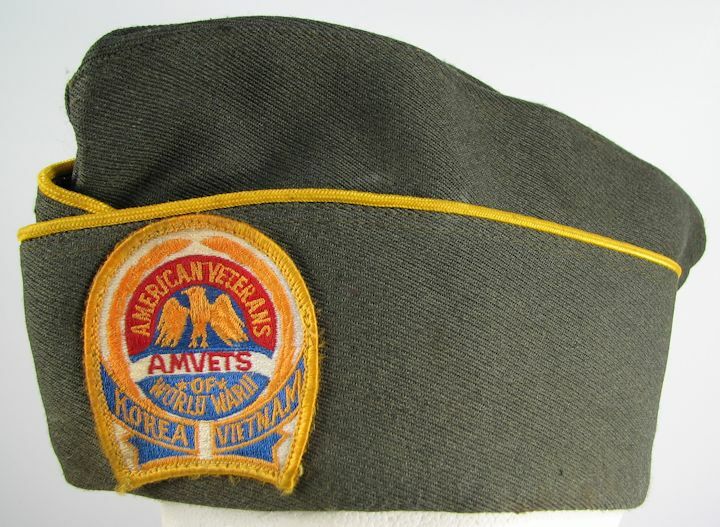 From a Korean War veteran's estate. Not named or ID'd. I see nothing wrong with this nice cap. 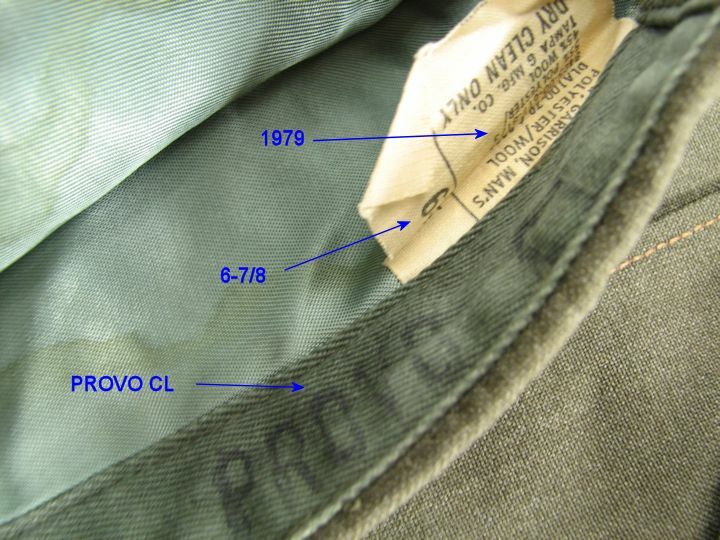 1950's ARMY OG-107 UTILITY CAP: Has been worn and washed and contract ink stamp is unreadable. The size "7" stamp is readable. I see no damage to it and it is clean. 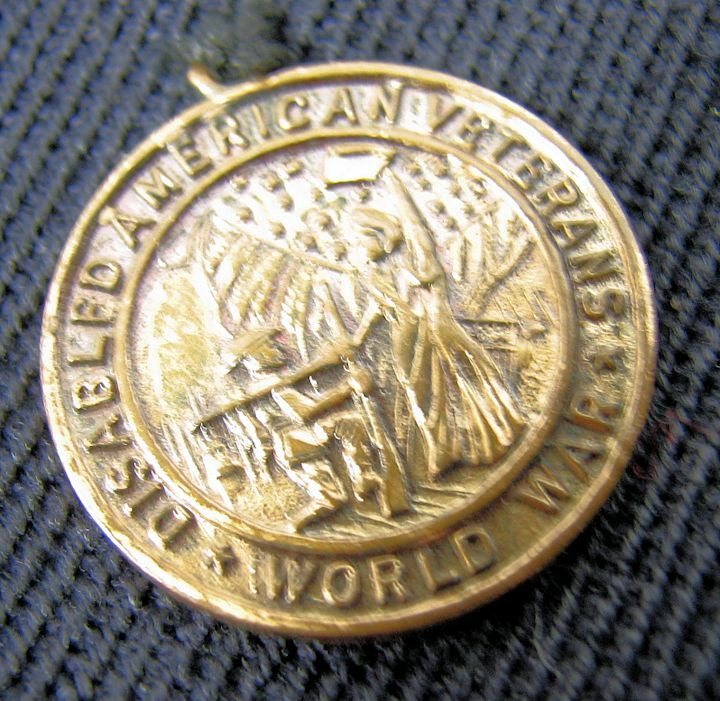 This old cap has a 2" patch on one side and a metal, nickle sized medalion on the other side that both read "WORLD WAR". I believe that would make it WW1 since that was the only World War at that time. I see no holes or damage but it needs to be cleaned. 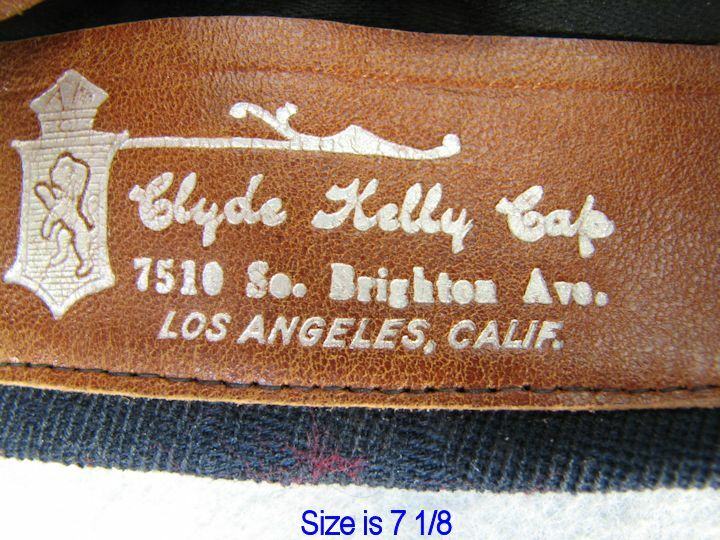 It has a leather sweat band with the retailer embossed on it; Los Angeles, Calif. It is a size 7-1/8. 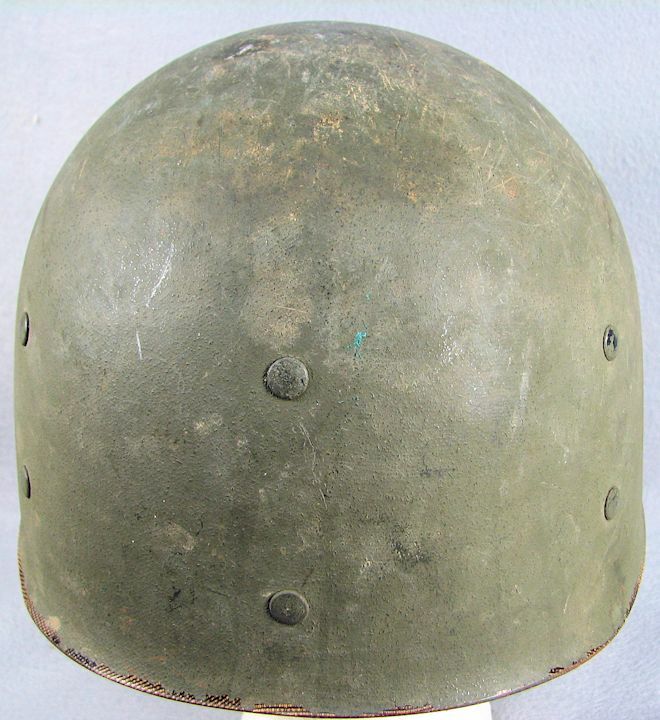 1950's HELMET LINER: Looks to have a 1957 manufacture date. 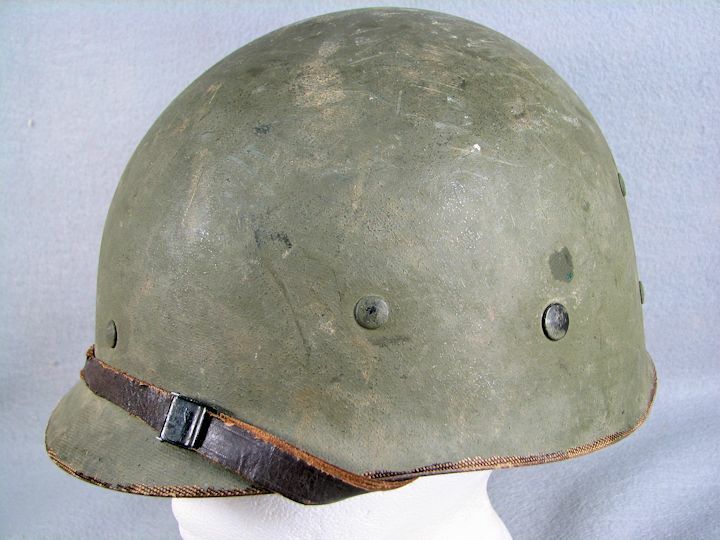 Appropriate for Vietnam War use but this is awfully nice inside to have had much wearing. Complete with the chin strap. I could find nothing wrong with this liner; it looks like a good one to me. However, the original exterior paint has lots of scuffs etc. All of the suspension metal parts are black painted steel with the exception of the nape strap snaps which are earlier blackened brass. 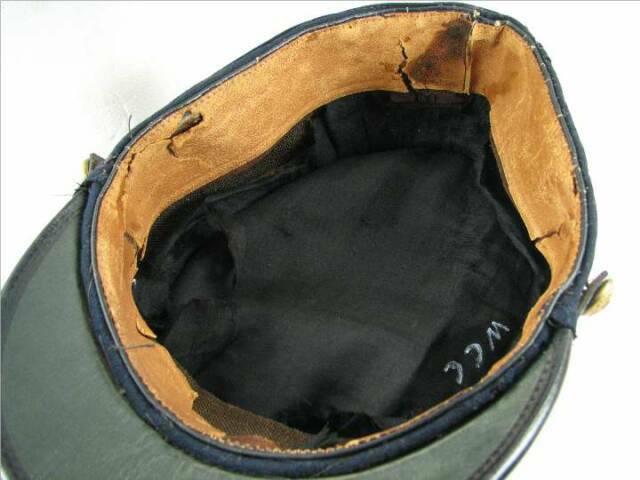 WW2, MINE SAFETY APPLIANCE LINER: I believe this liner to be WW2 production and fitted with a later headband. The headband weave is later type and it is held to the WW2 suspension webbing with black painted steel clips. 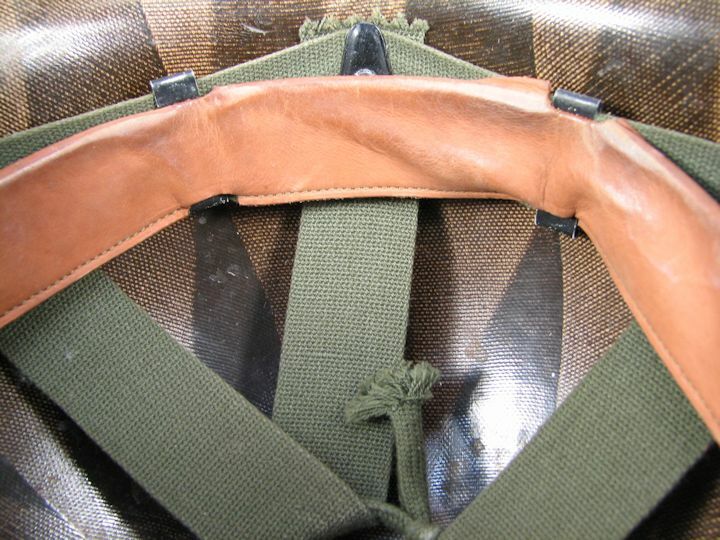 The headband is also installed wrong with the buckle in the front. The suspension webbing is HBT weave and is attached with blackened brass "A" washers (1944). 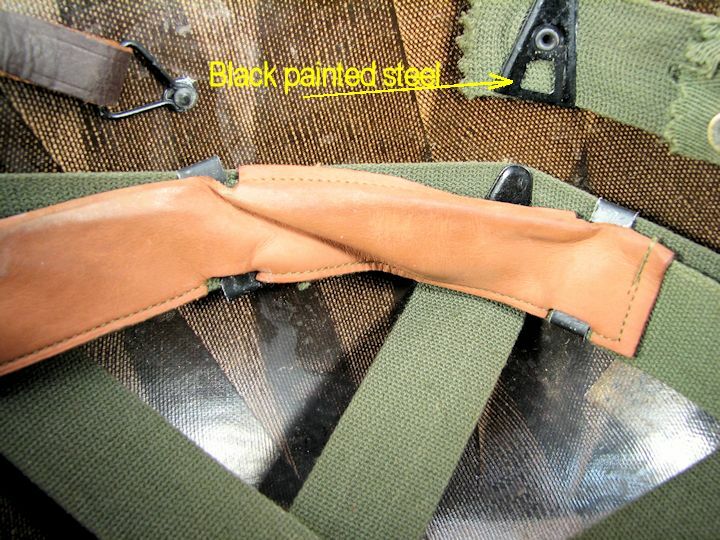 The nape strap is also later and one snap is pulled out. Heavily chipped repaint over two decals on left side. The decals look to be the Illinois 33rd Division and the 4th Illinois 130th Regiment. There is no chin strap. WW2 FIRESTONE LINER: I believe this WW2 liner was fitted with a later headband, repainted and used by the 33rd Division....probably Vietnam era. 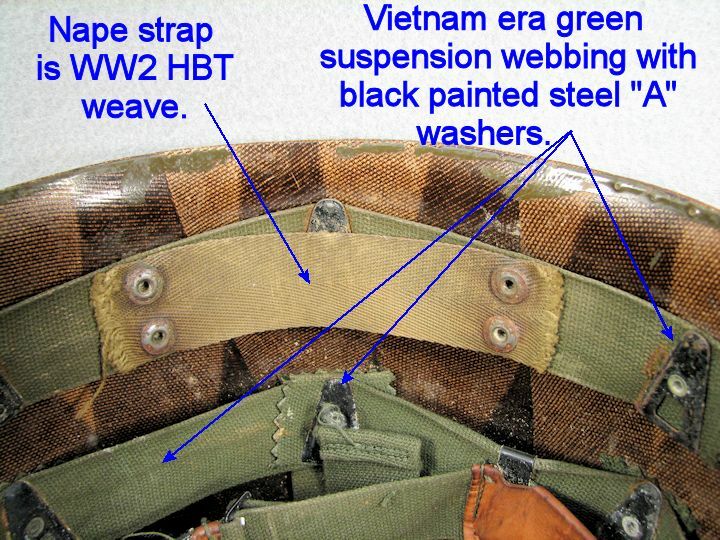 The suspension webbing is WW2 HBT type. The suspension "A" washers are WW2 brass. The Nape strap is missing. See the photos for text to further describe this liner. DOUBLE DECAL, VIETNAM WAR ERA, LINER: 33rd Division decal on left side and 129th Regional Training Institute decal on the right side. Suspension webbing is later dark green with black painted steel "A" washers. 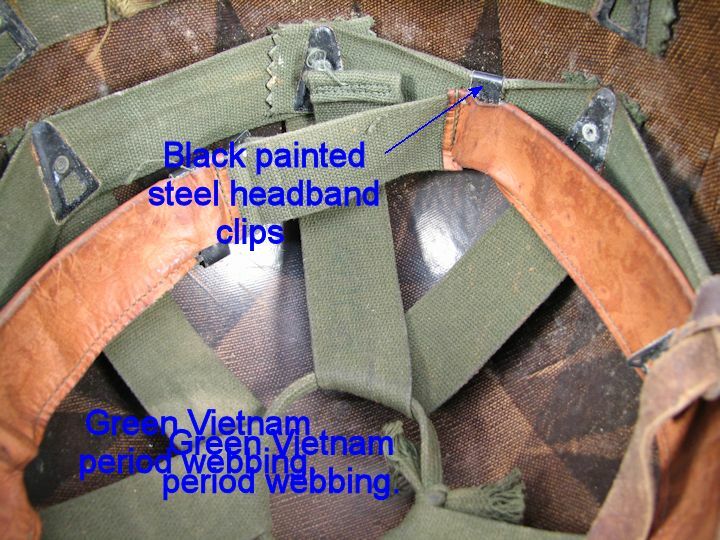 Headband is 1966 and attached with black painted steel clips. 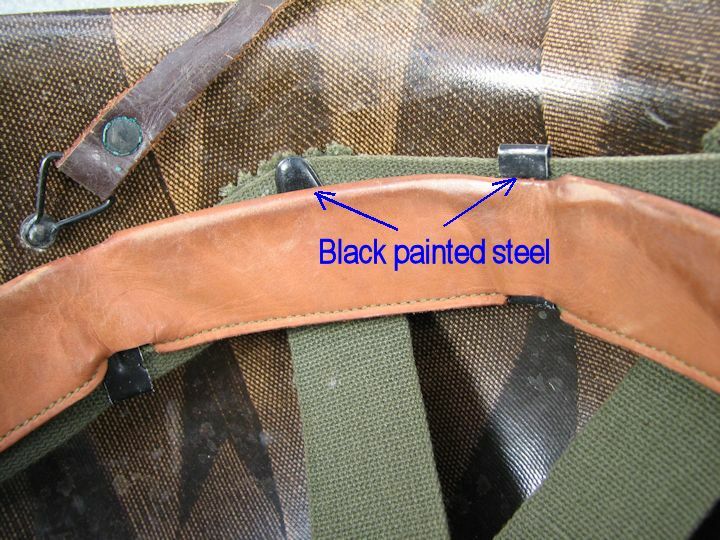 The nape strap is HBT, WW2 type. The headband is ID'd on the back side. 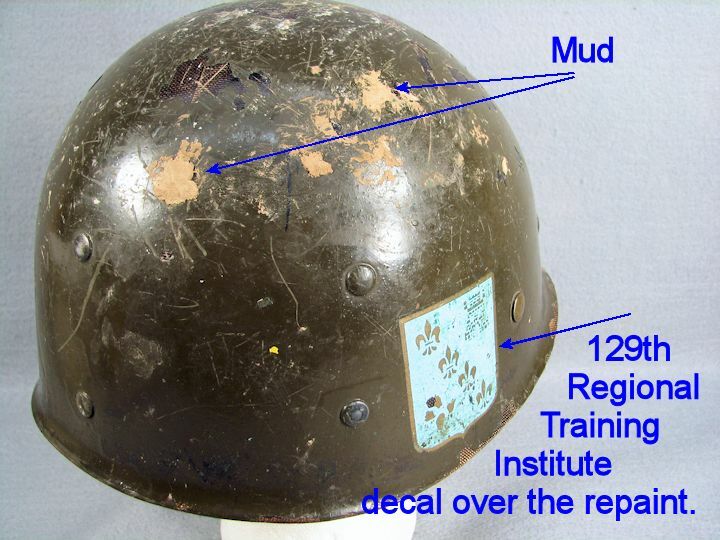 Decals were applied after repaint which is now chipped and has dried mud on it. Chin strap buckle is broken. 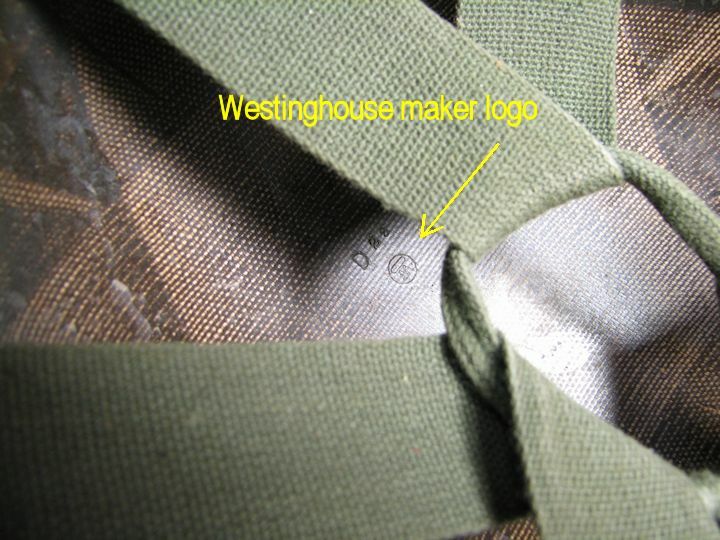 Westinghouse made with logo inside of crown. More info is on the photos. PARACHUTISTS KEVLAR, PASGT HELMET COVER: "Jackson" is written on the outside. Size Large/X-Large. Woodland pattern. I see no problems with it. O.D. 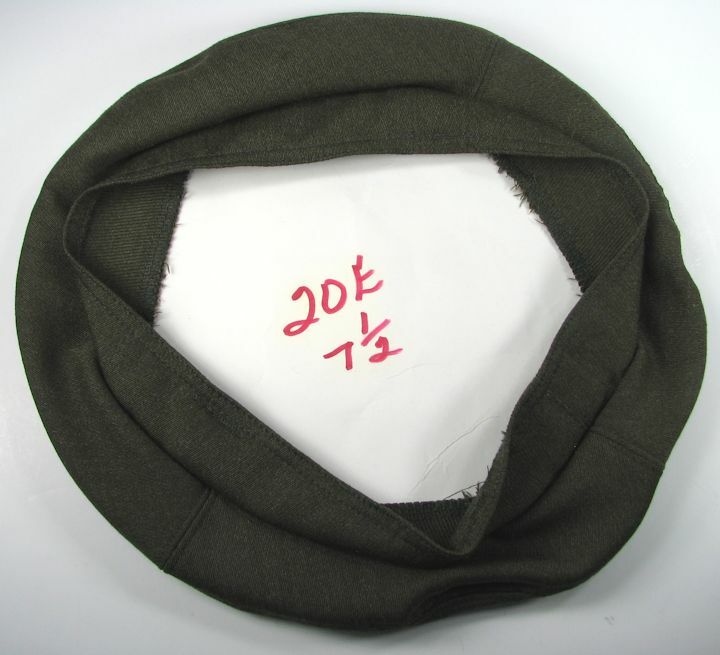 WOOL GARRISON CAP, KOREAN WAR: This fine condition Garrison Cap is tag dated 1950. It is 100% Virgin Wool. Size 6-7/8. 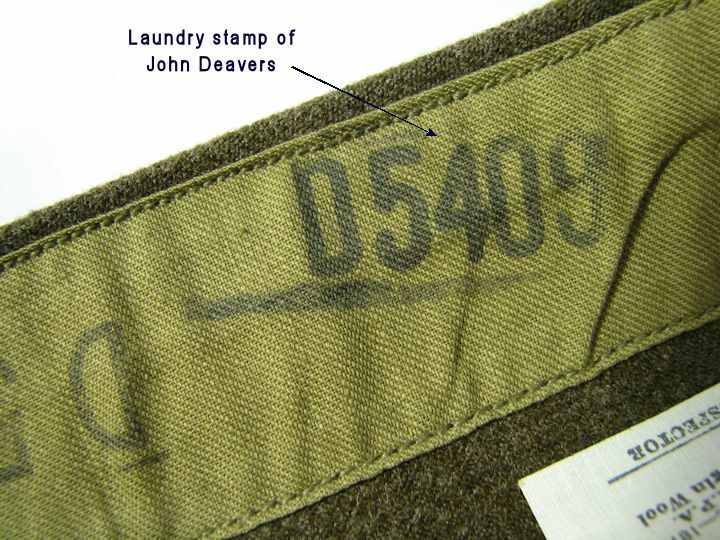 ID'd by laundry stamp to John Deaver. 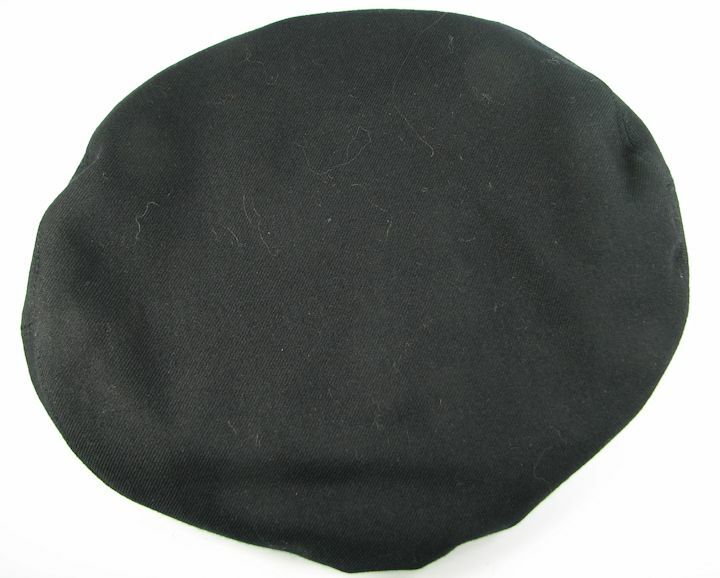 I see nothing wrong with this fine wool cap. 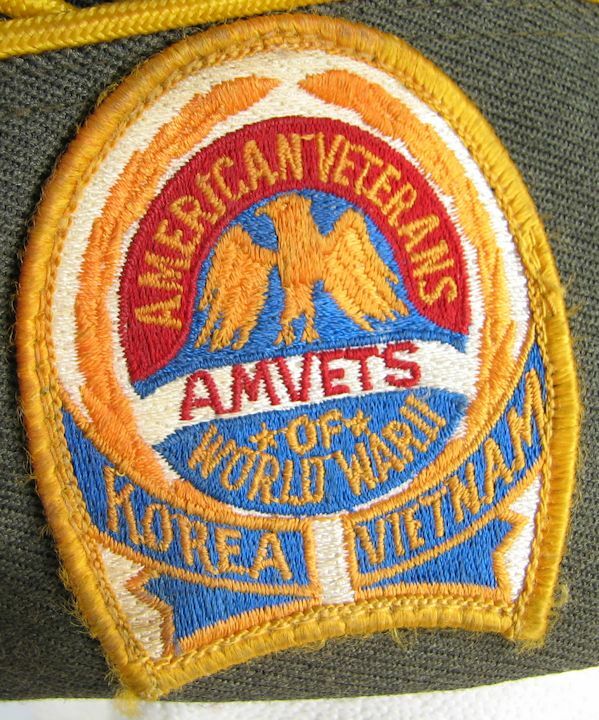 AMVETS "CHARTER MEMBER" CAP: Cap is patched with the AMVETs, Korea/Vietnam patch. 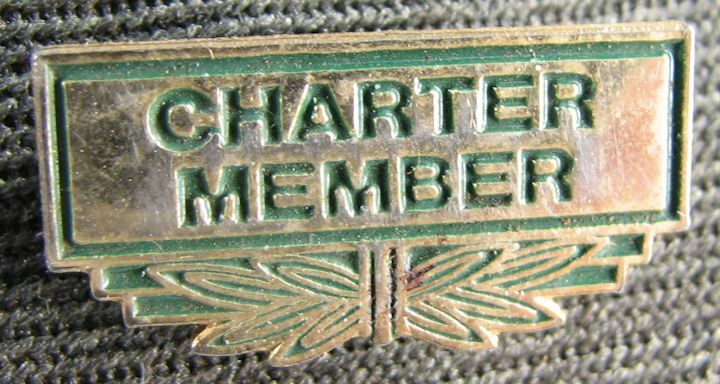 It has a Charter Member pin on the side. 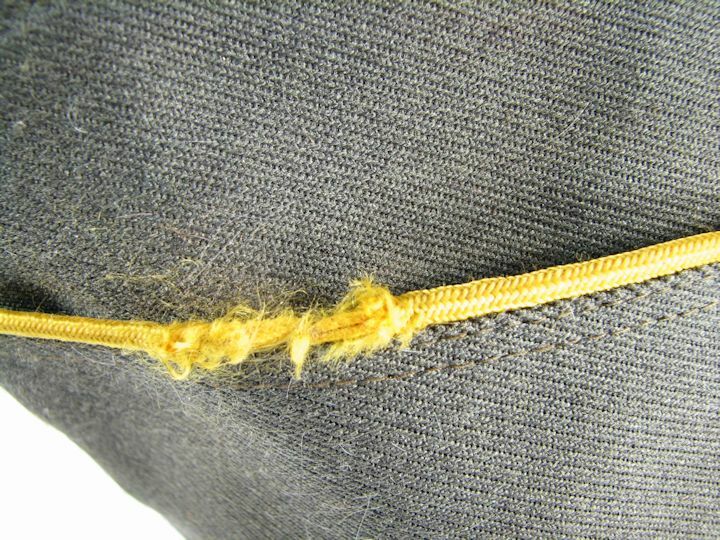 The yellow piping is frayed in one area as shown in the photos. Buy it for the price of the patch and pin. V.F.W. 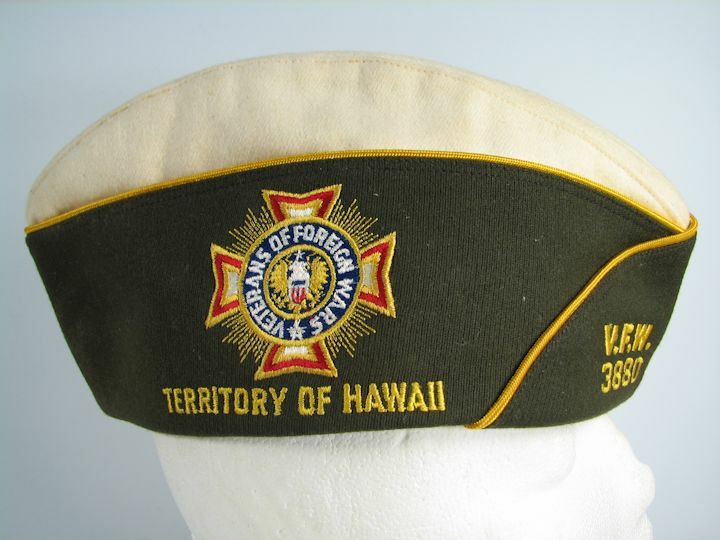 cap, Post 3880 from the "TERRITORY OF HAWAII". Dated 1959 before Hawaii became a State. 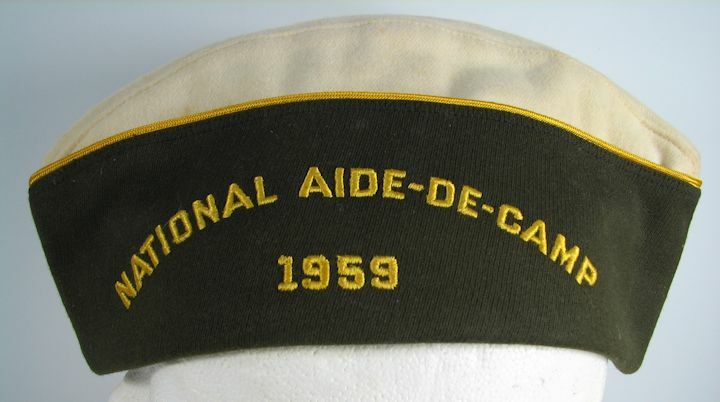 Also belonged to the "NATIONAL AIDE-DE-CAMP". 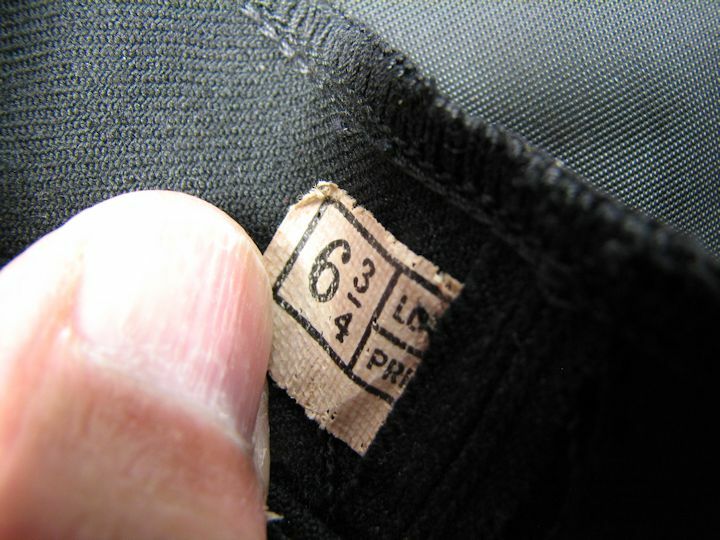 Size tag reads 6 7/8. No damage seen, just minor soiling. 58 years old! 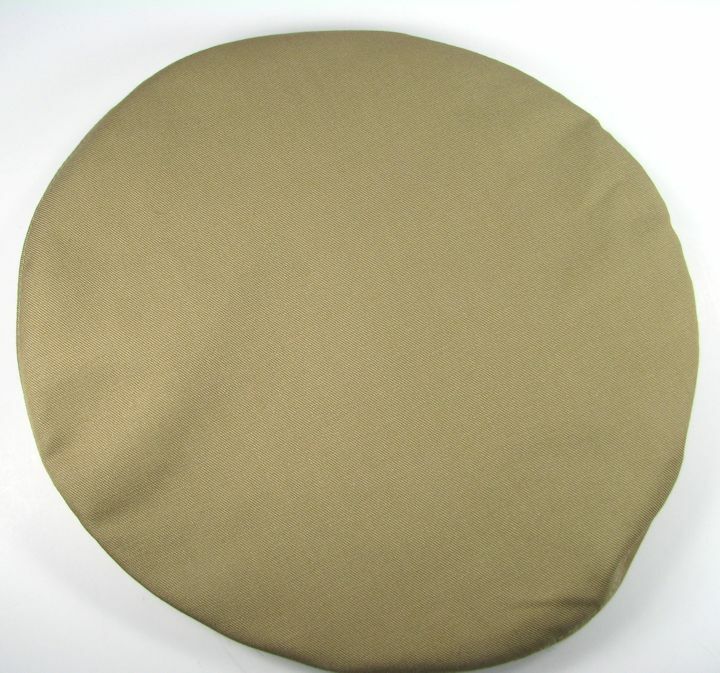 USMC GARRISON COVERS: Three available. All ID'd to "PROVO, CL". All are 55% Polyester/45% Wool. Two have Contract tags one is private purchase. Two are size 7, one is size 6-7/8. One (private purchase) is undated. 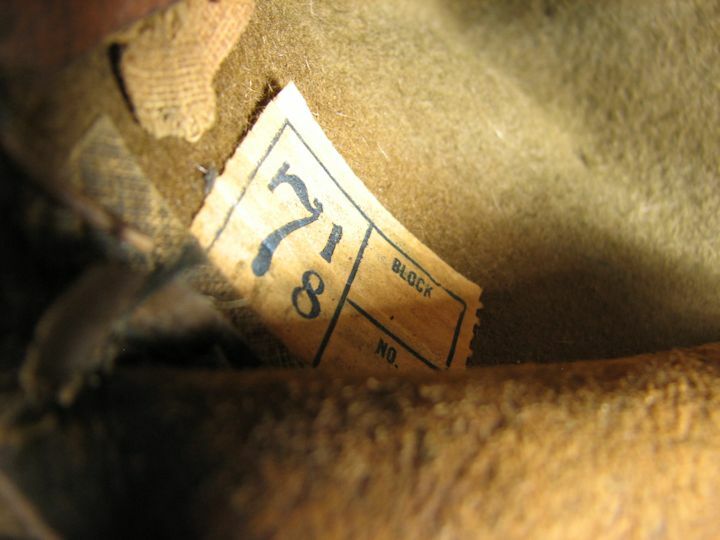 One contract tag date is 1981 and the other is 1979. 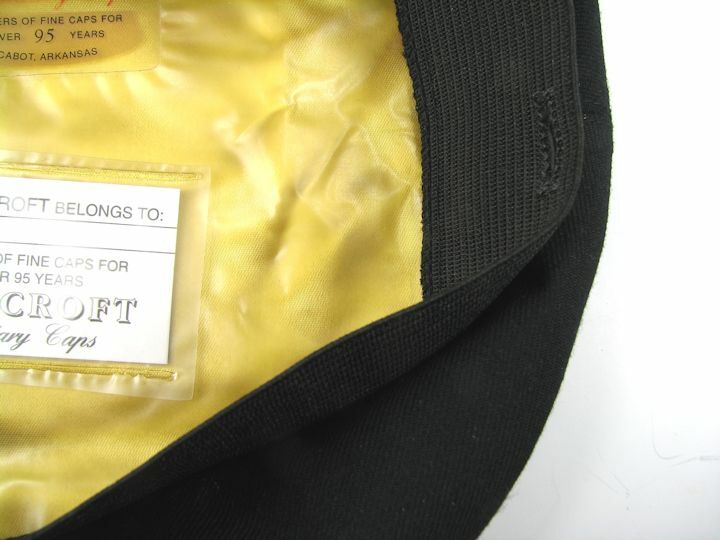 All have slick interior lining and all have cloth sweatbands. Your choice on these. 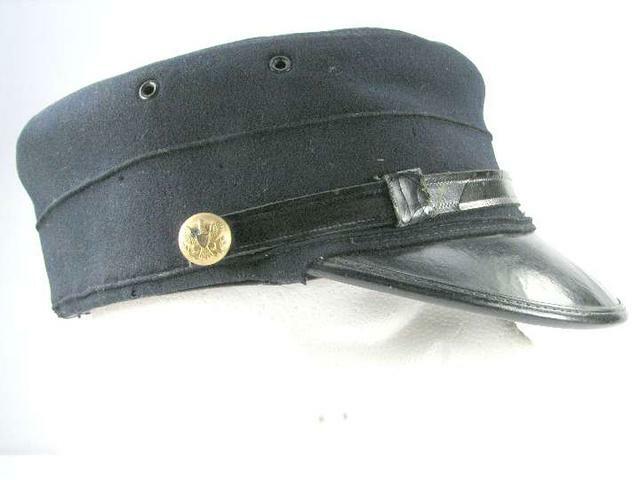 MODEL 1889 CAMPAIGN HAT: From my personal collection I offer this early 1889 campaign hat. 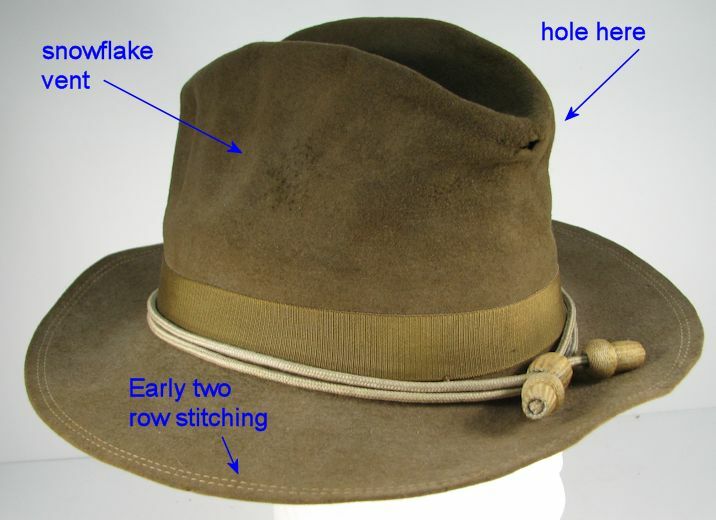 It has the two row stitching on the brim which changed to 3 rows in the early 1890's. 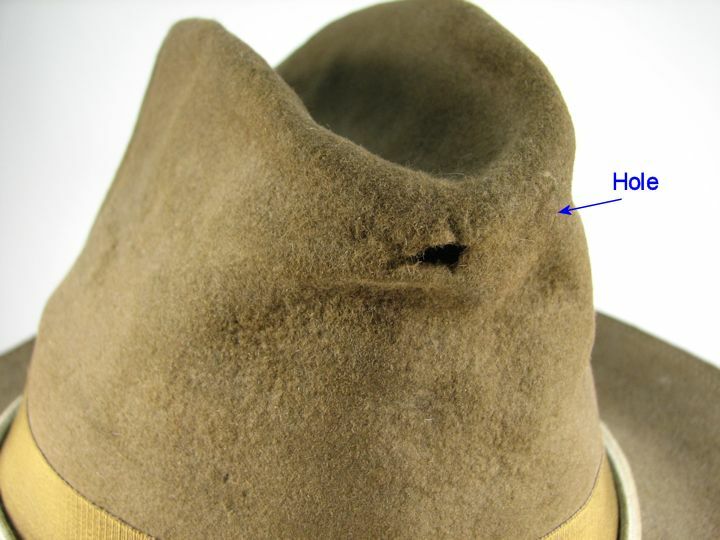 There is a hole from flexing the crease at the front and a break in the felt at the back caused by the same flexing. The only readable tag is the size tag. This is the real deal and is in very good condition for these early hats. 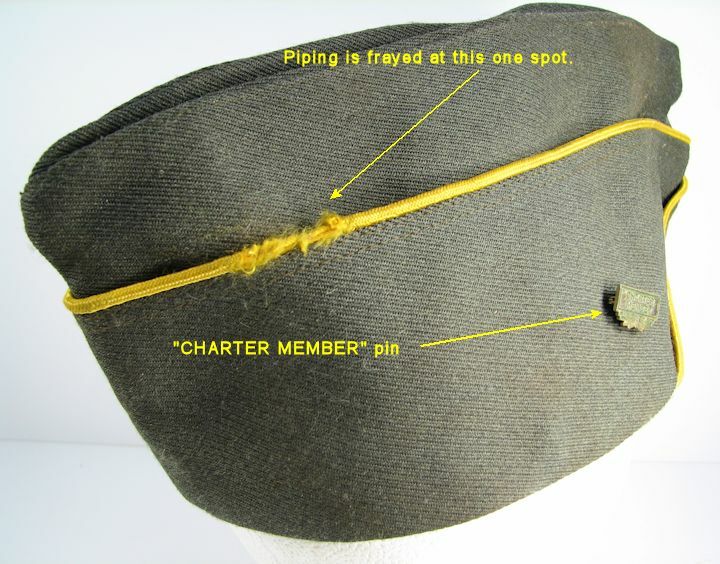 GARRISON CAP, WOOL, SIGNAL CORPS: Leather sweat band. Slick lining. No ID or size tag in it. Piping is believed to be SIGNAL CORPS. No holes. 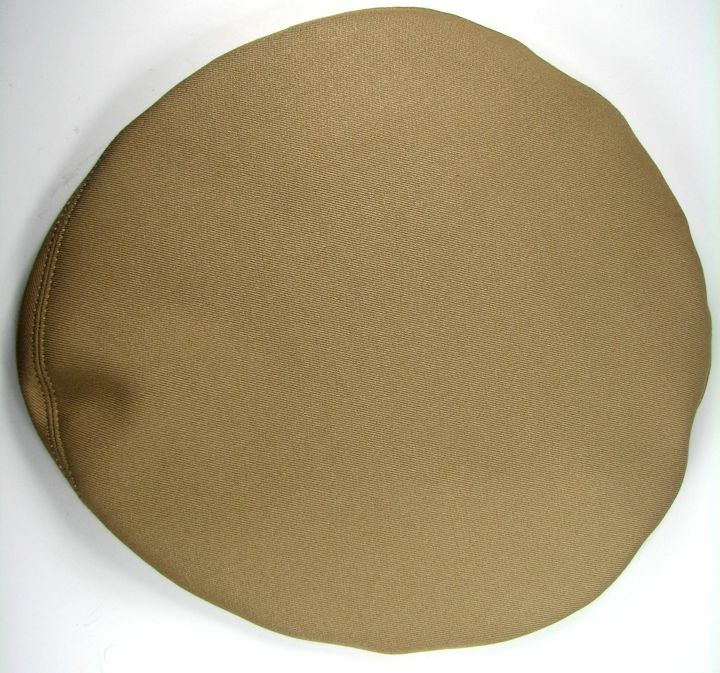 GARRISON CAP, KHAKI, SIGNAL CORPS: Leather sweat band is worn. Slick lining. A couple laundry ID's in it. Piping is believed to be SIGNAL CORPS. 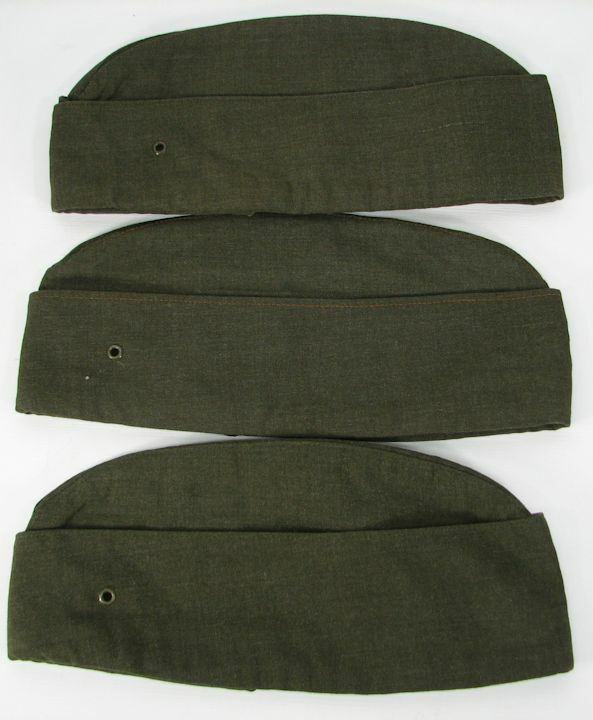 GARRISON CAP, WOOL, MEDICAL CORPS: Cloth sweatband, no lining. No tags or ID's visible. Branch piping believed to be MEDICAL CORPS. Evidence of branch insignia disk on left front. No holes noted. 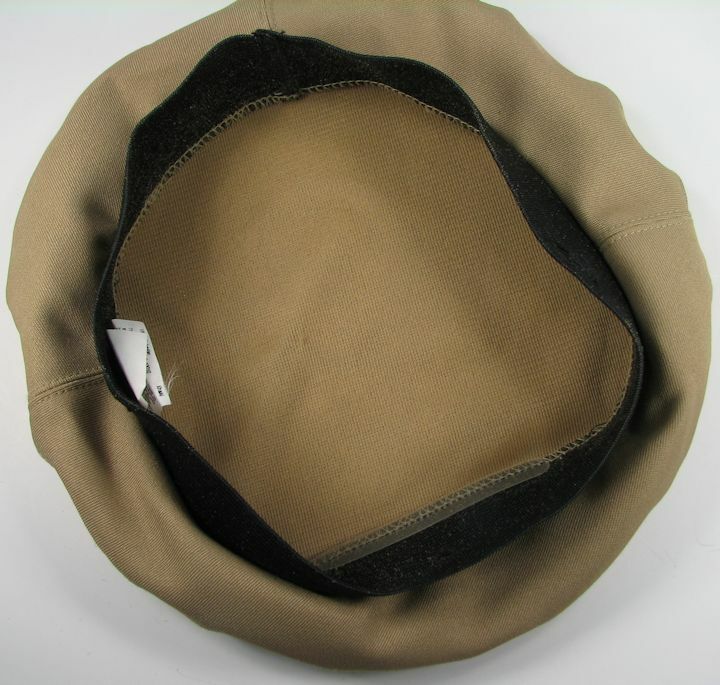 GARRISON CAP, KHAKI, ENGINEERS: Leather sweatband, slick lining. 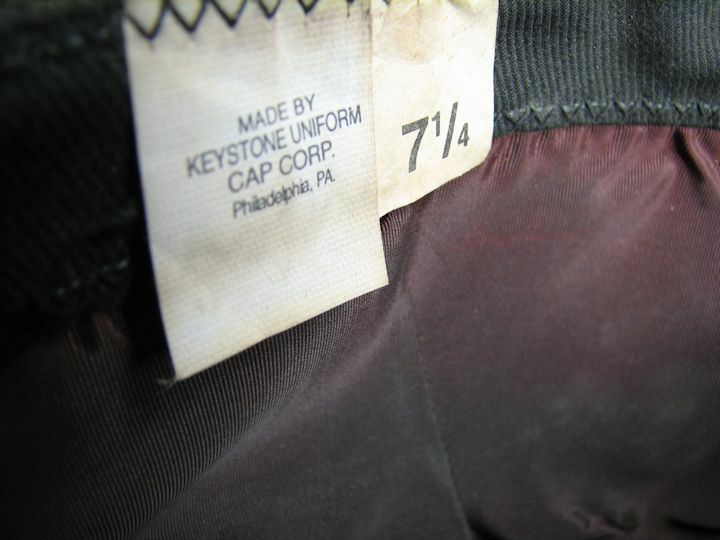 Size tag in place. No ID's visible. Branch piping believed to be for ENGINEER CORPS. One small stain noted. 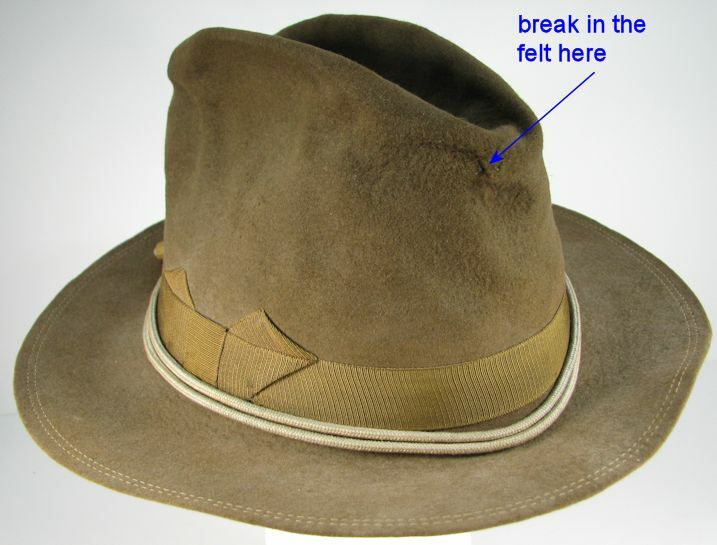 U.S. ARMY OFFICER'S HAT: Nice hat with no problems noted. I believe it is not real old. Size 7. Bullion on the visor for higher ranking officer. Front badge included. It is a screwback. Plastic stiffener on inside to form the top. BATTLESHIP USS MISSOURI, BB63. 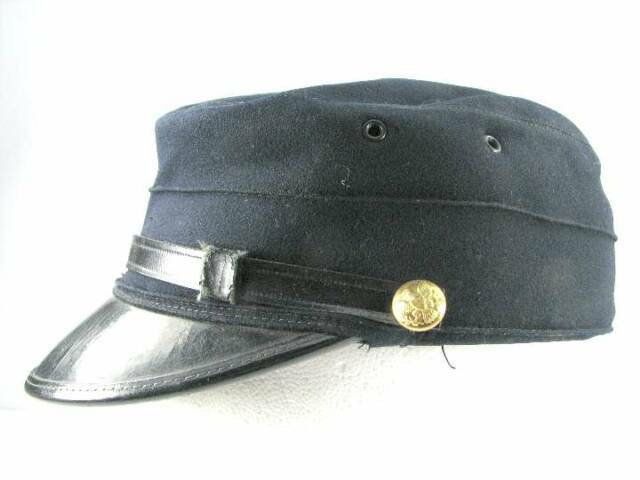 VETERAN'S BALL CAP: Famed Battleship, the Missouri. Hat has been worn. Adjustable in a large size. 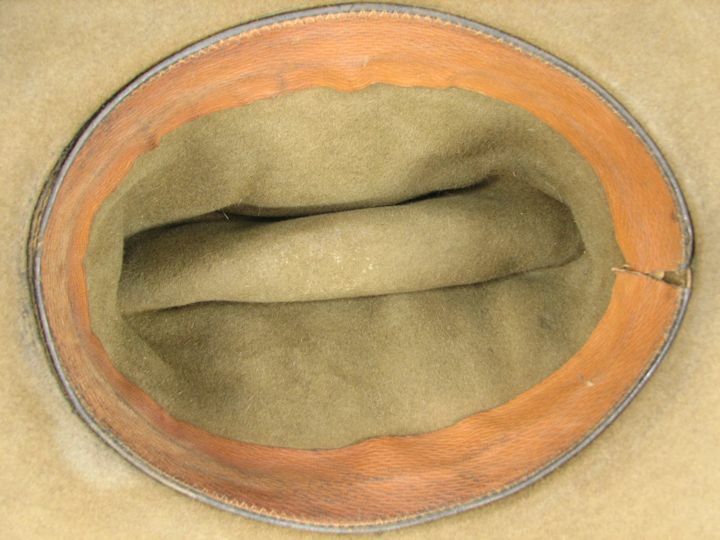 EARLY WW2 McCORD SHELL with FIXED BALES and FIRST PATTERN HAWLEY LINER: I have had this for a few years and have decided to let it go. The fixed bale McCord has a heat lot # 56C. 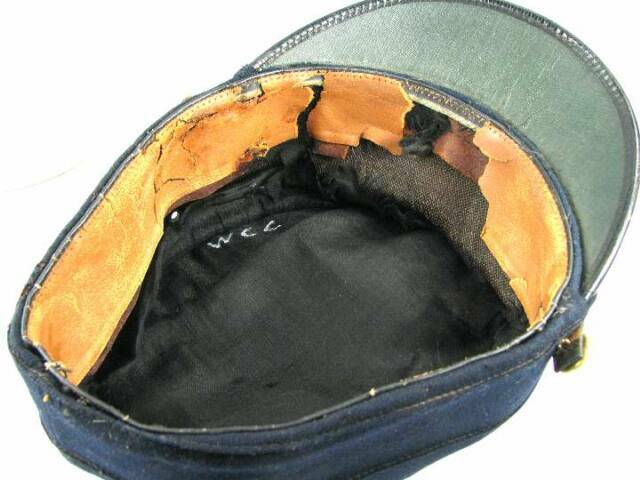 It is front seam and has sewn on chin straps. 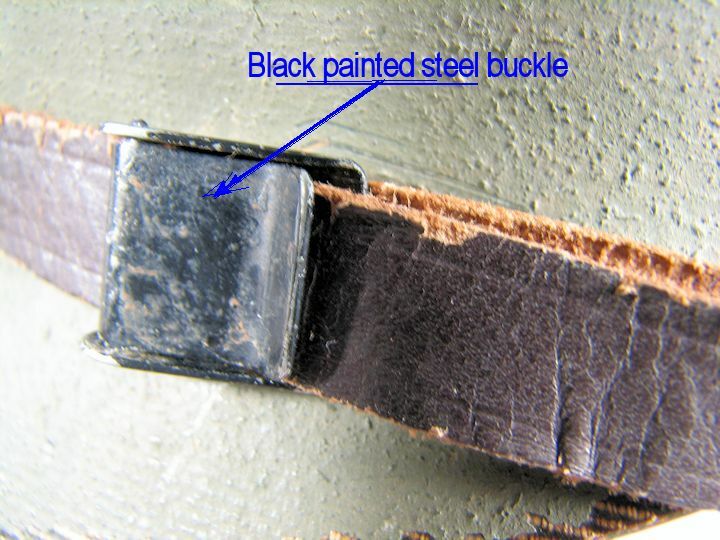 Strap's buckle is blackened brass. 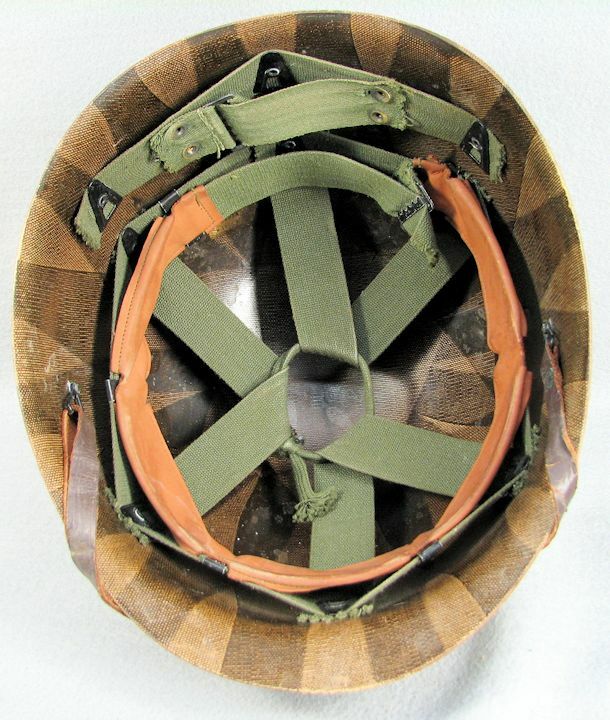 Nothing on the helmet is magnetic; bales, shell nor rim. It has some paint scuffs and scratches and there is a shallow dent in the front where the cork coating is missing. This shallow dent transferred to the Hawley Fiber Liner which to me indicates this set has been together since day one. As mentioned, the Hawley liner has a shallow dent in the front that matches the dent in the shell. This liner has the 1st pattern Rayon webbing which will date it prior to June of 1942. None of the hardware in the liner is magnetic. The snaps are marked UNITED CARR. 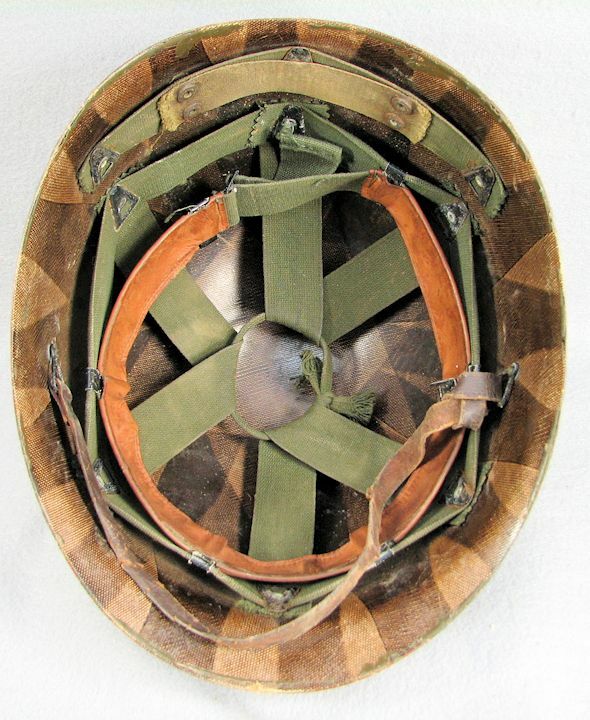 The leather chin strap has a brass buckle which has some green corrosion. 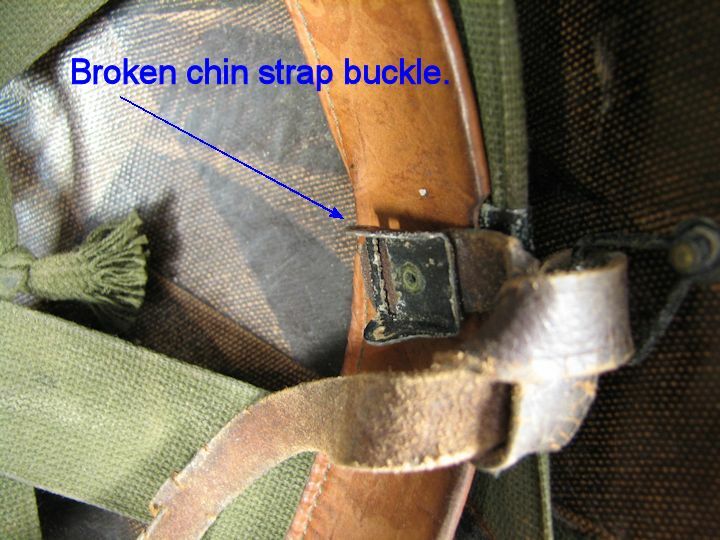 The chin strap's clips attach to the liner with rivets and are not removable. 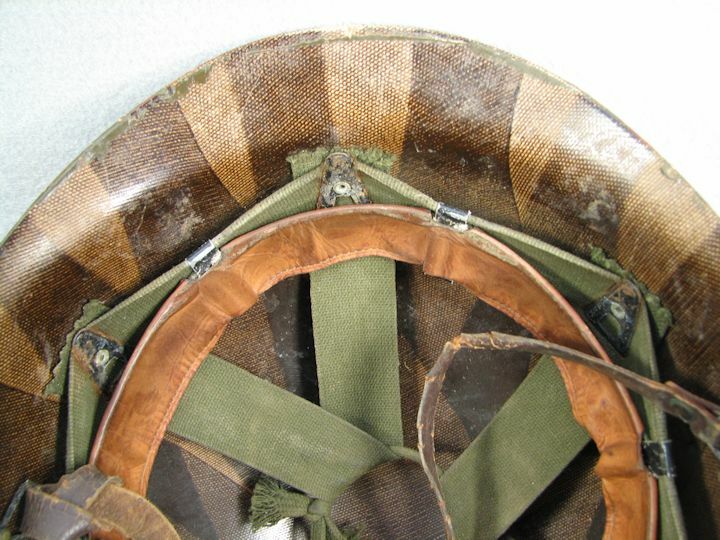 The nape strap has light soiling from when it was worn as does the leather sweat band. Other than the dent in the front the only damage I see on the Hawley is a small wear spot on the front edge. There is an ink stamp inside the Hawley that says: "LINER"; there may have been more to that at one time? Please view the photos as I show all this, as well as additional text in the pictures. This is probably the best M1 Helmet I will ever have and believe it would be hard to upgrade. Thanks. Early McCord Shell, Fixed Bales. Sewn Chin Straps. Front Seam. Non-magnetic. Hawley Fiber Liner, 1st Pattern Rayon webbing. 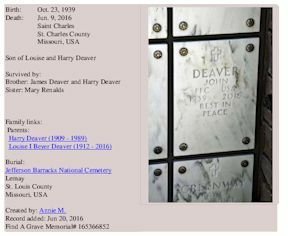 Click small image to enlarge -->. 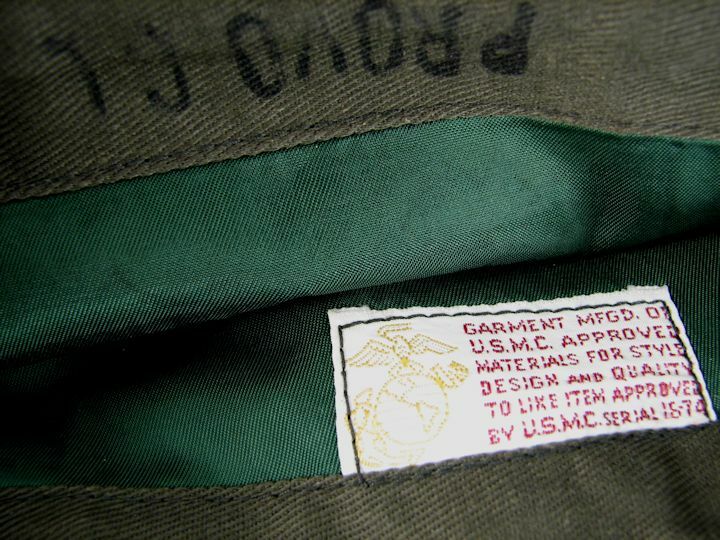 USMC DESERT MARPAT BOONIE HAT: The label has been removed so I can't say too much more about it. However, it did come with the USMC Desert Marpat Blouse and the shooting gloves that I have listed in the UNIFORM category. 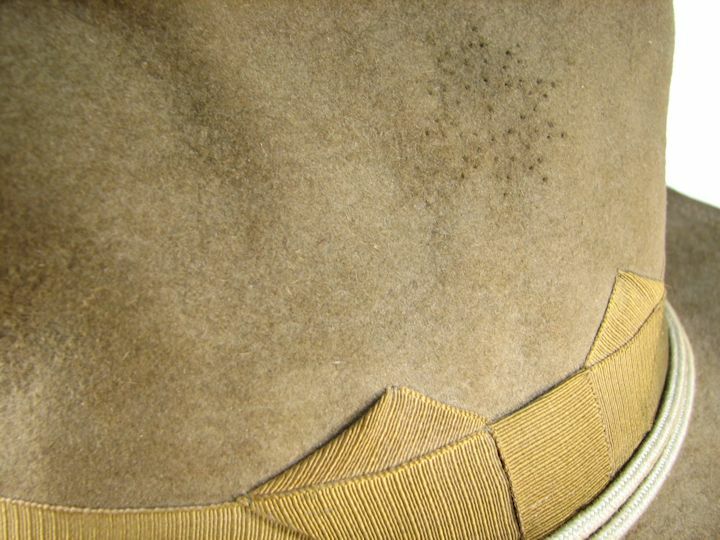 I see no damage to this other than the thread tracks inside the crown from where the label was. I will guess a small size. 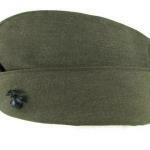 USMC WOODLAND MARPAT "8 POINT" CAP: No label in it but looks like a small size. Large EGA on the front. I see no problems with it.